We have opened 140 times since 2009 and seen 19405 visitors and raised �4,578 for various charities. Driftwood featured in the national lifestyle magazine Coast in August 2017. In 2016 it appeared on BBC2 Gardeners' World last September and was a finalist in the Gardeners' World Magazine Garden of the Year 2016. I was listed as an "influential personality in the Sussex gardening world" in Sussex Life Magazine in January 2017. I've had a weekly gardening column in Weekend Argus since April 2017. Since December 2015, I have written a monthly blog on the Garden Media Guild's 2015 award winning website, Richard Jackson's Garden. 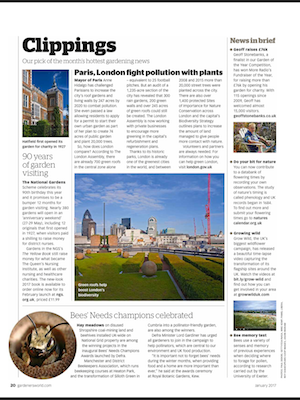 A monthly article on the garden has appeared in Garden News Magazine since 2012. In addition regular blogs written for Thompson & Morgan too. In September 2016 , Monty Don said in his introduction to the film of Driftwood on Gardeners' World, "Jane Moore has been across Britain looking at inspiring planting and design and this week is at Driftwood in East Sussex, a small garden by the sea that's full of character." Certificate of Excellence in both 2017 and 2018 on TripAdvisor, and listed on Great British Gardens website too. See all the details of the appearance on BBC 2 in 2016, the 2014 interview on ITV, all You Tube videos and images on Instagram by clicking the links below. The garden will feature in the July issue of a lifestyle magazine "Seasons" published in The Netherlands. Popular TV Gardener, Christine Walkden will be at Driftwood on Saturday 27th July 2019 to open the Macmillan Garden Trail. Weekly gardening column in Weekend Argus every Saturday throughout the year. Monthly slots at 1020am on "Dig it" with Joe Talbot, discussing National Garden Scheme Gardens. Hear them all here via this media page. 8th year of monthly articles for Britain's biggest and best selling gardening weekly, in their "over the fence" Readers' Gardens section, view all here. 4th year of writing monthly blogs for Richard Jackson Garden website. Royal Garden party at Buckingham Palace in June in recognition of services to community and a reception at Buckingham Palace for Macmillan by HRH The Prince of Wales in January. Featured in an American gardening magazine, Flea Market Garden Style in April 2018. Awarded a 2018 Certificate of Excellence by Trip Advisor. Back in January 2016 I wrote blogs for both Thompson & Morgan and Richard Jackson's Garden on "10 years in my garden", both with images taken from the same point over a 10 year period. The garden has been successful in 3 national gardening competitions. 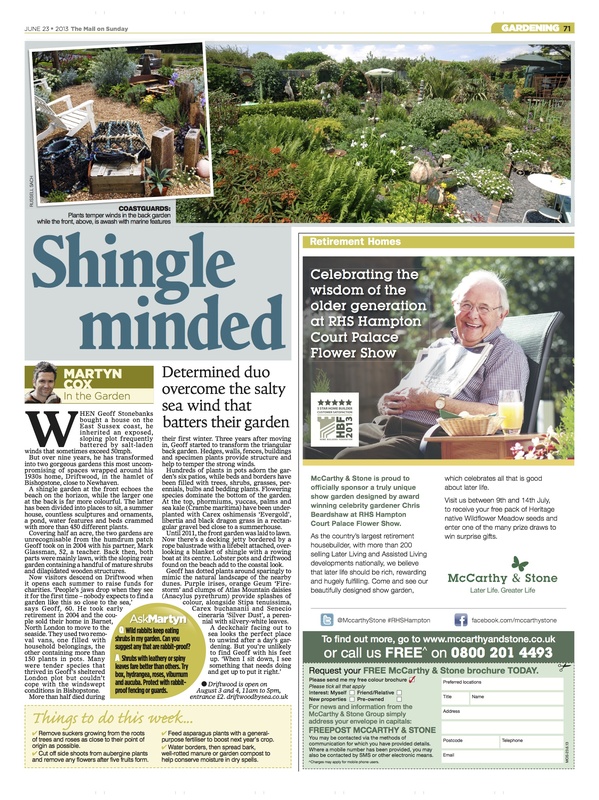 It won outright in 2012 with Garden News, and was a finalist in both the Daily Mail contest in 2012 and the Gardeners' World Competition in 2016. You can see the all latest garden tweets above. Check our Facebook page too. The Geffrye Museum is devoted to the history of the home, showing how homes and gardens reflect changes in society, behaviour, style and taste over the past 400 years. Our 2014 diary and images have become part of their Documenting Homes Project! Click the diary book cover below to read the diary in full. A 2019 edition, hard & soft back, book on Driftwood is now on sale on Blurb, click book cover to left to order. It's 190 pages with over 600 pictures of the garden at different stages of it's development. A PDF version can also be downloaded to PC or tablet for �.99. To the left is a short clip, taking you on a whirlwind tour of the garden in 2018, just before we opened the garden gate for the the National Garden Scheme in August. If you would like to see video clips from 2017, 2016, 2014, 2013 , 2012 , 2011 and 2010, please click the dates! Visitors coming during the summer and often ask what the garden looks like in the winter months! The short 5-minute video to the right, was shot in late February 2018 to give a flavour of the winter garden at Driftwood. The small lobster pot in the back garden hung on the wall of my parents pub, The Dolphin, in Oxfordshire for 30 years. Our tortoise, Hector, belonged to my Dad抯 sister, Margaret, right. There are many plants and objects in the garden that belonged to both her and my Dad, both of whom were very keen gardeners, along with many plants bought by friends and relatives. Many of the objects in both the front and back garden have a sentimental attachment. The fish basket at the back and the fish crates at the front of the house were used by my father, Ron, below, on the docks in Fleetwood in the late 1950抯. The fish crates are stamped with my grandfather's company name, C.F. Stonebanks and Co. Wyre Dock, Fleetwood! Below are the charities we will be raising money for in 2019! Book your own private celebration visit to the garden for lunch or afternoon tea in 2019. Click the image to the left to read my blog, posted on the Thompson & Morgan web site this month, on how gardening can be an art form, painting with plants and flowers! This month I launched a trial video on the new Instagram Tv. You can see all the videos posted through the summer months by clicking the logo to the right. This month managed to get out in the garden following a long virus infection. Started at the back of the house and tidied the patio followed by relocating of lots of containers around the garden. Major job completed this month with both the front and side of the house renovated and then treated with a 15 year warranty finish to protect from the weather. All the planting pulled back and containers removed for access and now all back in place. 2018 was such a successful year that a short film was made to recount the successes, month by month. I was very pleased to receive the certificate from BBC Community Heroes Awards, acknowledging my nomination in both the volunteers and fundraising catergories. We also had a lot of coverage on the internet with the Christmas decorations. The weather ws not brilliant during the month, so not a lot of gardening got done, we had some very misty mornings but the mahonia in the back garden shone through! 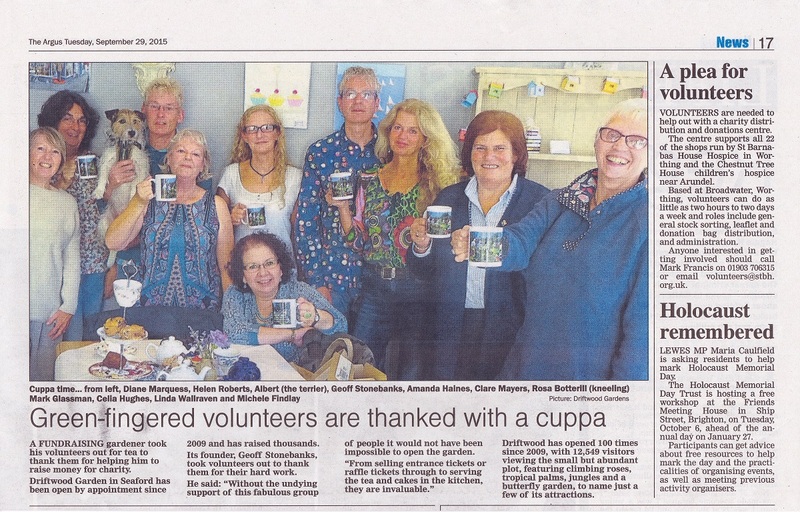 To thank the many volunteers who had helped in the garden this summer, we had a tea party in Church Lane tea rooms on 19th October and presented each with a gift of a Driftwood tea towel. October saw some gorgeous weather which enabled much time being spent in the garden, cutting back and preparing for the winter. A new succulent area was set up as well, created by digging out a bed by the green table and chairs. 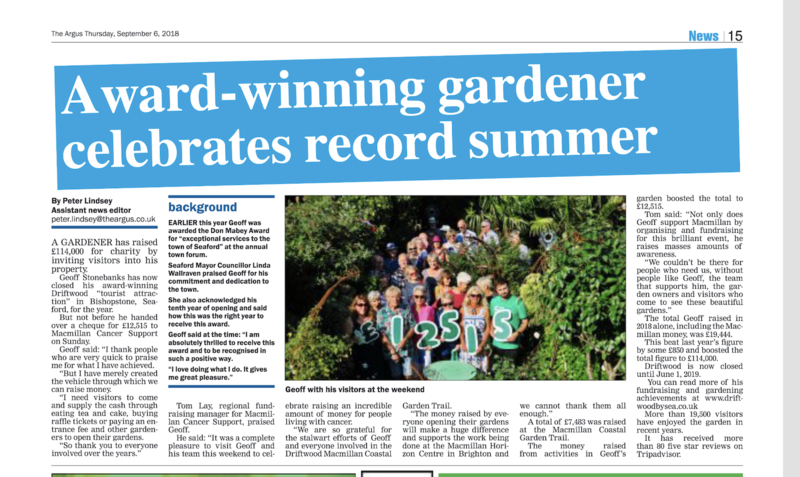 The end to a record breaking open garden season, celebrated in The Argus this month! The final garden opening of the year took place on 2nd September on the last day of the Artwave Open House Festival, when Tom Lay from Macmillan Cancer Support came and drew the raffle and accepted the monies raised in 2018 for the charity. On 25th August, holacaust survivor, Dorit Oliver-Wolff, came to sign copies of her book in the garden as part of the Artwave Festival. BBC SE Today presenter, Natalie Graham, visited too! On 5th August, a student from the University of Brighton media department, Hao Feng, came to shoot a final year project at Driftwood, making a short film entitled "My Garden", which you can see here here. It also happened to be our busiest day ever raising �00 for the National Garden Scheme and seeing 279 visitors. We also opened for Artwave and had many visitors who enjoyed over �00 worth of tea and cake. Short film made for BBC SE Today on 14th August too. Our second coach tour of the season saw Hampstead garden Suburb Garden Club visit the garden. On 28th July, Jim Buttress came and opened the Macmillan Garden Trail. On the 10th June TV celebrity and garden designer, Juliet Sargeant, came along to open the Mayor's trail. We also had a coach tour from Sweden (right) come and see the garden as well as a coach group from Dublin too. As the season got underway we have had many private visits to the garden, this one was the U3A from Steyning who had a very enjoyable visit on the 13th June. 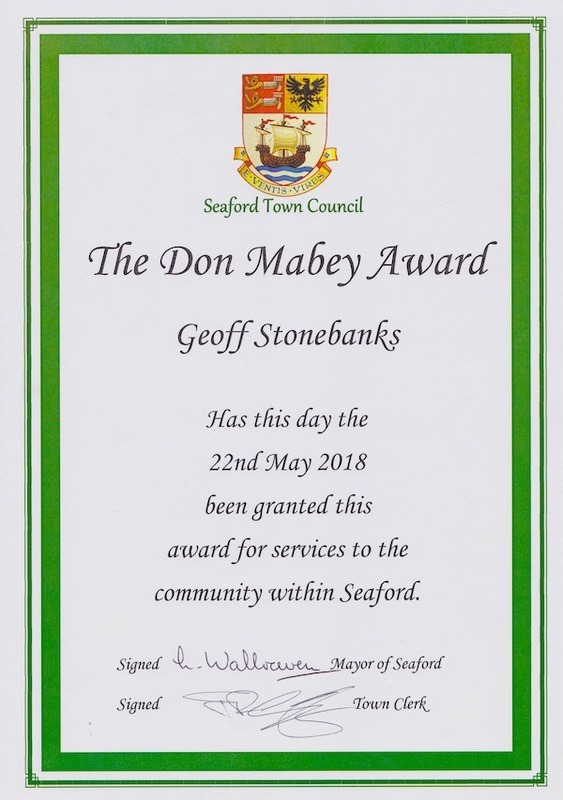 On 22nd May I was invited to the Seaford Forum and was truly amazed to be awarded with the Don Mabey trophy for "Exceptional services to the Town of Seaford"
I was asked if some visitors from a local B&B could visit on 15th May and was pleased that the garden was looking good! A couple form Berkshire and a lady from Indiana enjoyed the garden. I planted up a lovely birthday present and hung it in the garden too. On the 3rd and 8th May I made my annual pilgrimage to the local nursery to buy all my annual bedding plants, plus a few perennials. I am very fortunate to be able to buy at trade prices and this year spent nearly �0! It took over a week to plant them all but the garden looked wonderful when complete. 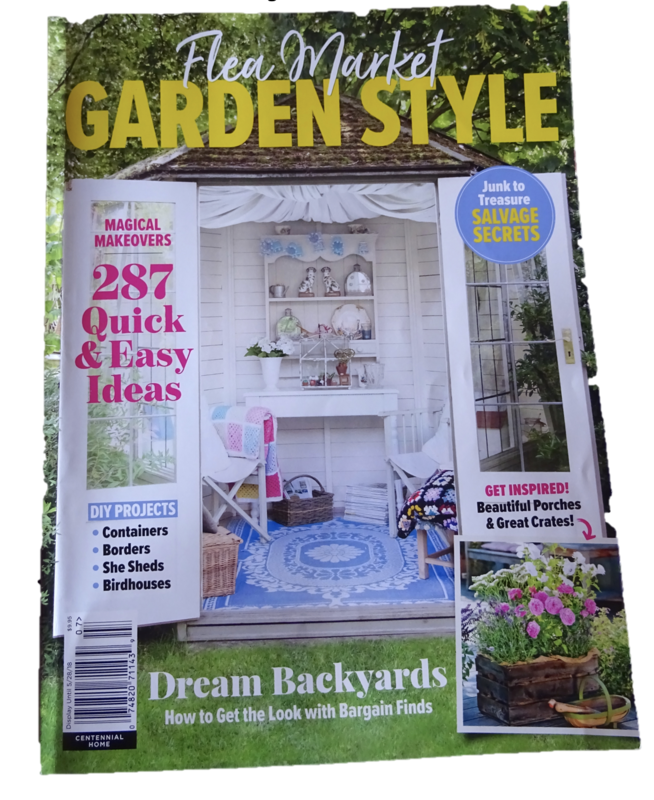 An American gardening Magazine, Flea Market Garden Style featured the garden in its April 2018 issue. There were 6 pages, including an interview with me. Several other pictures were included throughout the magazine too! You can read the whole piece here. With the advent of April it seems as though Spring has really started to appear. The hyacinths in the back garden have looked amazing. With the milder weather I decided to get all the agaves out from their winter home at the side of the house and tidied up the beach garden as I put them all out! With the final improvement of the weather towards the end of the month, I was eventually able to get out and deep clean the hard landscaping throughout the garden. Not before time. This month I had 4 garden talks to present, and here you can see the sessions at Lindfield, for the Haywards Heath U3a on the left and in Ifold Village Hall for the local gardening group on the right. On the 1st March a blog on my top 5 tips for coastal gardening, which I had written for Mr Plant Geek, Michael Perry, was posted on his web site. You can read it all here. I also put together a short film of the winter weather and bitter cold winds that hit the garden as part of the "Beast From The East!" During the month I had some new patio slabs that looked like railway sleepers put down in front of the shed which improved the area! A lot of time was spent out in the cold tidying up around the ponds area too. February brought some extremely cold weather along. We even had a few flurries of snow at the beginning of the month! The snowdrops looked lovely in the pots in the back garden. On the evening of 31st January I was invited to a Macmillan Cancer Support reception at Buckingham Palace. I was one of 180 very lucky volunteers for the charity to go along and meet HRH, The Prince of Wales, who hosted the evening. You can read more of the evening and see more pictures here. On 21st January, I and a group of 7 garden volunteers were invited to the Argus Community Stars Awards at the Dome in Brighton. It as a great affair with presentations in the main auditorium. There were over 500 people attending and the event was compered by Fred Dinenage. Unfortunately I did not win but it was amazing to be part of the ceremony and witness all the amazing groups and individuals collecting their certificates. On the 5th January, Thompson & Morgan published a blog I had written about a year in the life of the garden. I had taken an image of the back garden from the same point on the same day each month during the course of 2017. Click the logo to see all 12 images and the blog! They also invited me to be part of the 2018 customer trials programme! I also received an invitation to a Royal Garden party in June for my services to the community, utterly amazing! For the second year, one of the aeoniums stored in the back porch has flowered again this month! I was invited to a free flight on the British Airways i360 on the 5th January as a finalist in the Community Stars Awards run by The Argus. Click link to see full details of the nomination and awards ceremony. I was amazed to receive a phone call from Hannah Murray, the presenter of Daybreak, the breakfast show on Talk Radio Europe on the 2nd January. She had seen all the publicity on the Christmas Trees in the Daily Mail, she had then found all the information on the garden and wanted to chat to me live on the show on Wednesday 3rd January! You can hear the 12 minute interview by clicking the logo to the left! Some great publicity for the garden in the second half! Nothing at all to do with the garden, but in December we had amazing media coverage of my collection of Christmas decorations! They featured in both Daily Mail and Daily Mirror and a short film was made by the BBC for the local news as well. You can view all the coverage via this web page. On the 7th December, I received an official invitation from Buckingham Palace, my company requested by HRH, The Prince of Wales to a reception for Macmillan Cancer Support. Read all about the event here. On the 6th December I learnt that I had become one of the 3 finalists in the Community Stars Awards and had been invited, along with 7 guests to the awards ceremony at the Dome on 21st January 2018! November was a quiet month on the gardening front with 2 garden talks, one to Lewes Ladies Conservative Luncheon followed by one to Peacehaven Horticultural Society later in the month. We were also invited to attend the 1st birthday and official launch of the Macmillan Horizon Centre in Brighton too. Driftwood Fundraising Group had contributed over �000 to it's funding. On 7th October a whole page featured in the Argus newspaper that I had been nominated for their Community Stars Awards for 2017. In September 2017, a friend flew over the garden in a light aeroplane and took some photos of the garden in relation to its surroundings! Great images. Above, I treated all the garden volunteers this Summer to high tea at Church Lane Tea Rooms on 25th September and presented them each with a specially commissioned, hand coiled pot by Amanda Haines. At the QVC location shoot in Chiswick this month, I was able to meet up with Richard Jackson and talk to him about the the possibility of him sponsoring the Macmillan Coastal Garden Trail again in 2018. I am very pleased to say that he has generously agreed to do so! I was invited to be part of a film shoot with QVC and Richard Jackson's garden, on location in Chiswick on the 14th September. It was great fun with a group of 6 others. 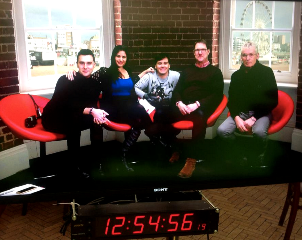 The results will be aired on QVC later this year, or early next! For 4 days at the end of August and 2 in early September, we were part of the Artwave Open House Festival and had the most succesful year ever in terms of visitor numbers and artist sales. On the final day we presented Macmillan with �148, the best ever fundraising year for them with a further �00 for other charities. Amazing! The best fund raising year too since we first opened the garden. On the 1st August the family Songyeun Li, from Beijing, arranged to spend the day in the garden and had a wonderful time. They had a talk followed by lunch and when leaving they presented me with a lovely gift of a boxed, handmade fan! They had read about the garden on TripAdvisor. He later wrote "I'm very glad to meet you. I like everything about your garden. You really work hard in the garden. We greatly admire your persistence and efforts! I hope we can come back to visit your garden next year. If you visit Beijing, we will be your best guide." Back in the Summer of 2016 one of the team from Coast magazine came to interview me and brought a photographer to capture the garden. This month, the wonderful 8 page feature appeared in the magazine. It had an amazing response with nearly 20 readers getting in touch and coming to see the garden for themselves, as well as one lady from the Isle of Wight wanting to buy one of the chicken wire seagulls! Read the full article by clicking here. The 6th annual Macmillan garden Trail took place on Saturday 29th and Sunday 30th July. It was a weekend of two halves with rain most of Saturday and a beautiful day on Sunday. Visitors turned out in droves though on the Sunday and the trail raised over �00 for Macmillan cancer Support and the Macmillan Horizon Centre. Nigel & Sue Napier, (right) travelled from Stowmarket to see 25 of the 27 gardens. Joelle Leader, Director of Volunteering, at Macmillan Cancer Support said after the event, "I want to extend a huge and heartfelt thank you to Geoff for his relentless fundraising and commitment to Macmillan in order to make this all happen and to everyone else too whatever you do whether it is opening your garden, selling raffle tickets or making the tea because it is really making a difference to people who are living with cancer. Thank you so much again." On Wednesday 20th July BBC radio contacted me with a view to my being involved in a pilot programme being made. Here the call received here. The show was hosted by Matt Allwright and included Jim Buttress and Anne Marie Powell. After the recording the producer sent the text on the right! Wonder what will come of it? Two lovely ladies, Barbara and Jan visited the garden through Gardeners' World 2 for 1 on 20th July and had a great time despite the cool weather. On 21st July one of our helpers, Liz Holland organised a lunch party on the garden for her and 6 friends which went down very well. On 18th July we had a coach tour of 39 visitors all the way from Christchurch in Dorset. The trip had been booked on the strength of our appearance on BBC Gardeners' World last Autumn. We were billed in their brochure as "one of the most talked about private gardens in Sussex with a web site complimenting the calibre of the garden." Not Bad! Now here is an interesting story! I received a phone call at 1530 on the 3rd July from a French lady, Marie Christine Vandenbroeck! She, her husband and 3 friends were touring in Sussex ready for Glyndebourne and then Hampton Court Flower Show. She loves reading old English gardening magazines and had read about Driftwood and hoped they might be able to visit! So, all five came at 4pm to see the garden and stayed for an hour and a half. She told me she had a lovely roof terrace garden in Paris. She bought a hosta and wrote in the Visitor's Book: "We were very happy to have discovered such a great small garden. Thanks. My hosta will be called in Paris, Hosta Geoffrey!" On 1st July we opened for local Sussex charity, Family Support Work. It was a beautiful day but rather disappointing in visitor numbers! We still sold lots of tea and cake though! On the right Gillian & Geoffrey Broom came and visited the garden privately and were very complimentary! On 19th June a group of ladies arrived from Tokyo. They had heard about the garden and arranged their flights around the garden open dates. I persuaded them to visit on a non public day for lunch so they could have the garden to themselves for a few hours. On the left a group of 11 ladies from Falmer came to visit the garden one evening and had an enjoyable time. Likewise, 4 friends came to celebrate a birthday by spending the morning in the garden too! This month there seems to have been a large number of birds in the garden, especially robins! Here are two pictures taken of them outside the office window. The Mayors Open Garden Trail took place on the 11th June, the first public day of 2017. The weather was a bit cool but the opening ceremony went well with Mayor of Seaford, Linda Walraven, and local MP, Maria Caulfield, on hand to do the honours. There was a grand raffle and lots of money raised for Seaford Lifeguards. Pre booked visitors to the garden on 6th June, Kathleen and Lindsay Anderson enjoying tea and cake in the Summer House out of the wind! Really lovely comments from them both, despite the garden having suffered much damage in the last 36 hours! Amazing comment in the Visitor's Book! "Visited after horrendous winds, but garden still looks absolutely stunning. We are so impressed with the imaginative design and the jolly use of the art work to enhance the rooms. Geoff gave us a fascinating guided tour and delicious tea and cake too! We are truely inspired! Thank you"
On 3rd June we held the tea party for garden owners for the Mayor's Garden Trail on the 11th June. It was a shame that 3 of the gardens were not represented. Mayor of Seaford, Linda Wallraven was on hand to thank those involved. On 25th May, the prebooked visit by the Austrian Horticultural Society took place. The group were on a Sussex & Kent gardening tour, taking in the likes of Great Dixter, Sissinghurst, Nymans and the like. I was truly amazed to be included in such illustrious company, as you can see from the tour schedule on the right! There were 29 visitors who arrived by coach and their guide who came on the hottest day of the year. They were treated to a talk about the garden and a tour followed by home-made tea and cake, all served on vintage china in the garden. May sees the purchase of all the bedding plants for the garden and I ended up making 3 trips to Saxon Plants in Polegate in order to buy all the plants needed. I spent an incredible £750 (at trade prices) to complete the garden for the Summer season. The succulents survived the Winter well, either in the back porch or the greenhouse and look resplendent again by the Summer House. This month I was asked to film a short video for the National Garden Scheme to help promote their new partnership with Macmillan Cancer Support. The piece was shot in the garden and posted to You Tube and can be viewed here. 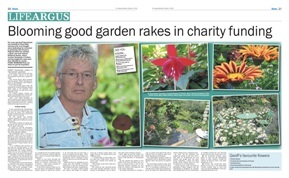 On 11th April I was approached by the Editor of The Argus to write a weekly gardening column starting on the 22nd April, every Saturday in a new magazine they were publishing! Read them all here. The tulips this month have looked really amazing throughout the garden. I had planted a lot of new ones last Autumn and it was well worth the effort. On 3rd April a family staying in Sussex for a few days saw the garden on Trip Advisor and called to see if they could visit! They came along and had their own picnic so I served them tea to go with it! The bulb company, Bakker ran a competition on my twitter account and asked me to write a blog for them which you can read here. As a thank you they send a box of over 150 bulbs to plant in the garden. Having decided to buy some fibre clay containers as an alternative to the heavy terracotta ones, I ordered some from Primrose and posted the image of them in the garden on social media. I was amazed to find they got in touch and I ended up getting all those on show below, free of charge. I've now written a blog for them too and can buy goods from their website for a 50% reduction. Great company! The daffodils are doing well this month with many around the garden. I began deep cleaning the hard surfaces at the beginning of the month, starting at the top by the studio and working my way down the garden. It makes such a difference! Well! How about this? I wrote off to all news media at the start of the month about the visits to the garden from Japan and Beijing this Summer, to see if there was any interest! Well blow me down, ITV replied within minutes, saying it was a lovely story. They confirmed they had put it in their diary and that they would refer it to the Brighton office! Fingers crossed! A local photographer, John Glover got in touch and has agreed to photograph the garden throughout the year. His first visit on 12th February yielded some nice pictures of the beach garden. My latest blog for T&M, "An interesting Winter Garden" was posted on the 14th February too. February began with slightly warmer weather but still wet and windy! The camellias in the back garden have many buds and this lone one flowered as the month began! The weather needs to improve so I can get out there and start the great tidy up for 2017 season. Mid month the weather got better and I gave the grass banks their annual trim, ready for all the wild flowers and sea kale to grow! I was blown away this month to get an e mail from Suzan Matkin in Japan. She is a teacher and had discovered information about the garden in the Japanese media. She had searched to find the garden on the internet and had decided to arrange to bring a group of her retired lady students to see Driftwood this Summer. Flights already booked and they are coming on the 19th June! Amazing! During January there were some very hard frosts, along with thick fog. It all created a rather eerie look across the garden! 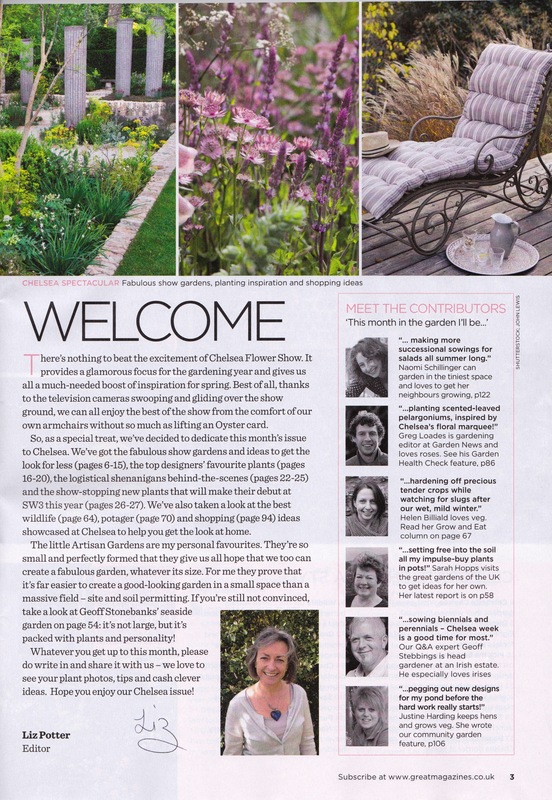 I also discovered that I had won a prize for the garden being selected as a "Happy Place" in Modern Gardens Magazine's competition and was in the February issue. 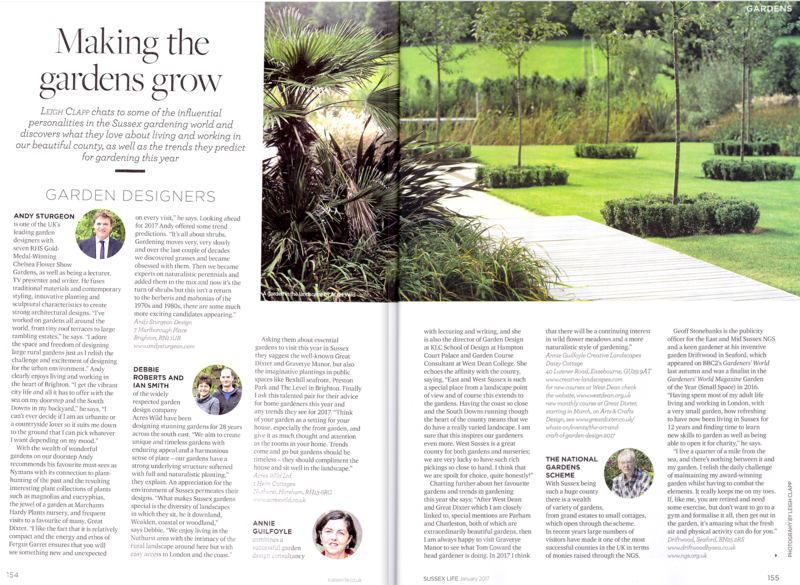 The January issue of Sussex Life Magazine (left) had a feature on some of the "influential personalities in the Sussex gardening world" and low and behold included me! 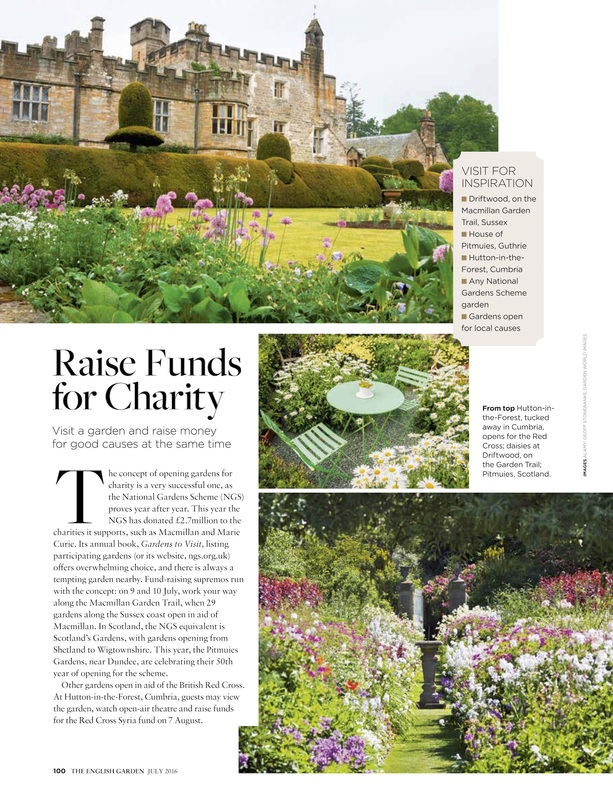 In addition, the January issue of Gardeners' World Magazine (right) mentioned the fundraising success of 2016 too. 2016 was a truly amazing year, with 4 major successes for the garden and I, appearing on BBC2 Gardeners' World, a finalist in Gardeners' World Magazine Garden of the Year, and Fundraiser of the Year in the More Radio 2016 Awards as well as being nominated as Fundraiser of the Year in the BBC Sussex Community Heroes Awards. It was very rewarding to find we had been listed in The "Best of England's" Sussex 2017 guidebook. The garden is featured on page 124. It also links back to the web posting we have on the Best of England website too. This month, I received a copy of a published report on "Garden visiting as a meaningful occupation for people in later life". I had provided access to people for the participant recruitment, a couple of years ago. The report finally got published and I am credited in the acknowledgements on page 774. Click image to read full report, or request a copy here. Tania Wiseman, from the University said "thank you once again for all the help you gave, it would not have been possible without you. 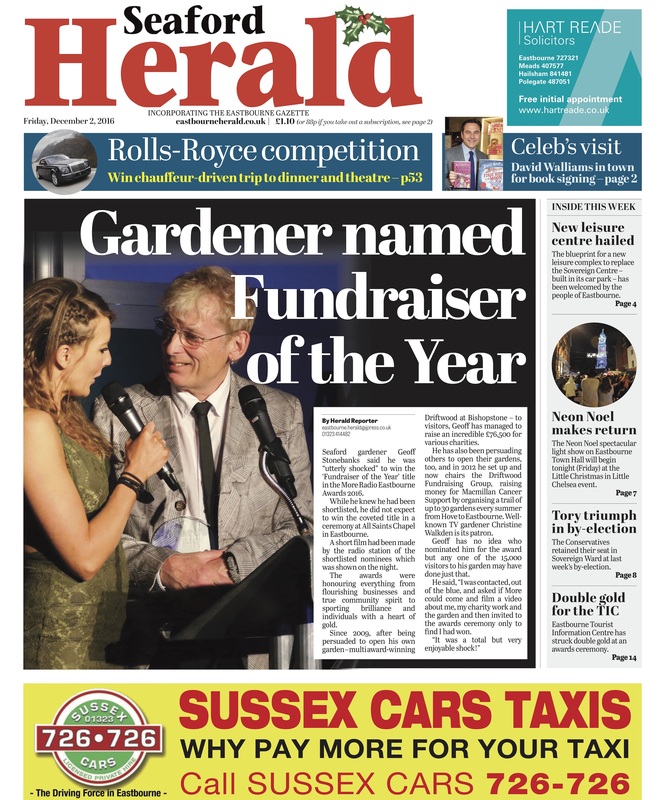 I was totally overwhelmed to find that on the 2nd December, the Fundraiser of the Year Award received last month made the front page of the Seaford Herald newspaper. This was totally unexpected, and like the award itself extremely rewarding. In November 2016, Gardeners' World magazine published a short video of all finalists in their Garden of the Year competition, 2016. You can see the short film on Driftwood on the right. On the 25th November we went to the More Radio Awards ceremony at the All Saints Chapel in Eastbourne and I discovered that I had won the Fundraiser of the Year Award. 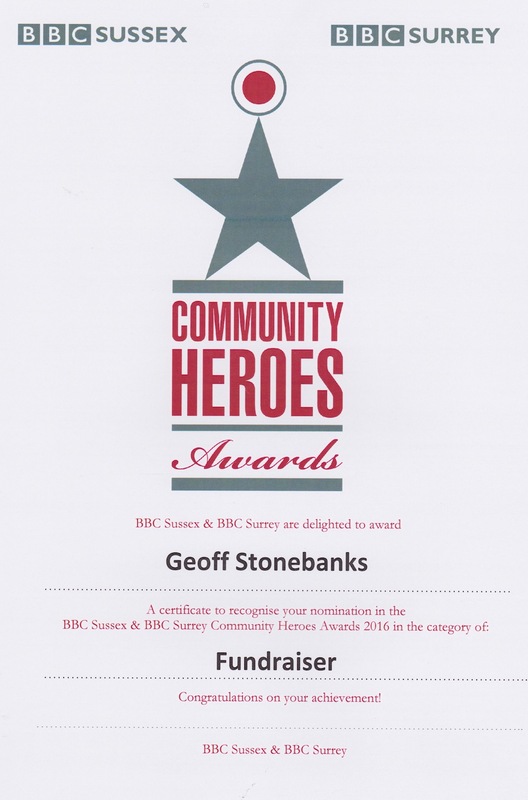 I was also very lucky to be nominated for the BBC Sussex & BBC Surrey Community Heroes Award for Fundraising. I tried out one of the prizes from the Gardeners' World competition and pruned several large shrubs and trees. The electric pole pruner was a great help! Much easier now to keep control of the taller trees and shrubs. On the 4th November, I was on the BBC Sussex Breakfast Show again, talking about the 1st anniversary of the BBC Weather Watchers project. Click image to hear the short session. Then, in the afternoon I received an e mail from More radio stating that I had been nominated and subsequently shortlisted for the Fundraiser of the Year Award at the forthcoming More Radio Awards Eastbourne on the 25th November! Amazing. The awards recognise everything from flourishing businesses, true community spirit, sporting brilliance and individuals with a heart of gold. 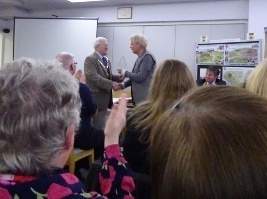 On the 3rd November I drove to Cranleigh, in Surrey, having been invited to give a talk about the garden to the local U3A garden group. I had a lovely reception from 2 of the group with tea and sandwiches then gave my talk to nearly 100 present. On the 4th, I received a lovely letter from local MP, Maria Caulfield, congratulating me on being a finalist in the Gardeners' World competition. On the 20th October it was confirmed that, although we did not win the Garden of the Year Small Space with Gardeners' World Magazine, we were a finalist and had won �0 worth of garden equipment from Cobra and would have the garden featured in the magazine in April 2017. Then on the 22nd October I received a copy of the magazine with the article and certificate! On 13th October we held a tea party in Church Lane tea Rooms in Seaford as a thank you to the volunteers who have helped in the garden this summer. Pictured from left to right are (standing) Clare Mayers, Celia Hughes, Geoff Stonebanks, Amanda Haines, Liz Holland, Linda Wallraven and (seated) Helen Roberts, Diane Marquess, Mark Glassman and Michele Findlay! This month, Sarah Wint published her book describing her tour of National Gardens Scheme gardens back in 2015. Driftwood had a small chapter in there too. RJ Cicero, who had visited Driftwood back in June 2015 also published his video on the garden as well! On the 23rd the garden featured in a 5 minute short film on BBC2 Gardeners' World. The piece was very well edited and really showed the garden off well. I received scores of compliments via social media too! Monty Don was very complimentary in his introduction as well! On the 22nd September, Richard Jackson, from Richard Jackson's Garden, came to see the garden and very generously agreed to supply Driftwood with Flower Power again in 2017. He also agreed to sponsor the Macmillan Garden Trail in 2017 too! Very generous guy! Thank you! His team also came and completed a photo shoot in the garden for promoting Flower Power in 2017 as well. After visiting he wrote "Thanks so much for today. I really enjoyed meeting you and seeing your fabulous garden. I knew, from what I'd read and been told, that it would be a real gem, but it was even better than I'd expected, packed with colour, interest, and charm. There was something to enjoy at every turn, and I genuinely loved it." On the 1st September the crew from BBC SE Today turned up having seen the article in yesterday's Argus. They filmed a clip for the lunchtime news which was broadcast but pulled the later video on the grounds that the article had been misleading on the Trip Advisor rating. They say they will broadcast later in the month, fingers crossed! You can see the clip from the lunchtime news here. On the 25th August the crew from BBC 2 Gardeners' World came to the garden and filmed a 6 minute video to be shown on the programme later in September, more to follow!!!! On the 31st August a wonderful article appeared in the Brighton Argus about the garden's rating on Trip Advisor and how successful it had been. It was a little over the top but great that it had been recognised as a good tourist attraction. On the 5th August, a TV Producer came to see the garden. She visited to check it out and see whether it fitted the bill for inclusion in a mainstream Tv Programme later in the year. Then, on 10th August it was confirmed they will use the garden and filming will take place, week commencing 22nd August. @driftwoodbysea @TripAdvisor Well done and it is all true. Keep up the great work. Christine Walkden posted a lovely comment on twitter after reading one of the TripAdvisor comments I posted. On the 30th July I learnt that Driftwood had been picked to go through to the final selection for the Gardeners' World, Garden of the Year Awards in the small space catorgory! It will now be shot and videoed by a professional photographer on 9th August and final decisons on winner taken later in the year! At the beginning of July we had a visit from a group of gardeners from Philadelphia. At the end of the month I received this wonderful handwritten card about the visit. They had seen many well known gardens in Sussex, such as Sissinghurst, but some preferred mine! Amazing! On 20th July we opened for the children's charity in Sussex, Family Support Work and raised �7 from the 134 visitors who came along. On 23rd July, the 16 strong group of ladies from the Telscombe Cliffs Women's Institute came and visited the garden for a talk along with tea and cake. On 19th July we opened for the National Gardens Scheme on the hottest day of the year and saw only 123 visitors! A friend from Instagram, Diane, from West Sussex (right)came with her husband Mike, wanting the see the garden for real, after all the images I had posted. Most visitors still enjoyed tea and cake ion the garden, like these 2 ladies from Eastbourne,	and we had visitors from Cheshire, Bognor Regis and Kent. On 18th July, Sue Mitchell and her husband spent over 3 hours in the garden with coffee, lunch and afternoon tea and cake to celebrate her 60th birthday. They took each element in a different part of the garden. They were both taken with it and bought my book as well! Sue wrote on retuning home "Thank you so much for a wonderful day. We are both in awe of your garden and can only reiterate how staggeringly beautiful and original both out front and the 'main event' gardens are. You clearly have not only a lively imagination and amazing artistic flair but the determination to source just the right plant along with just the right artefact for each and every part of the garden. The result is literally breathtaking.As I mentioned when we met, l am so chuffed that l could spend time with my husband in your private refuge, without a jostling crowd of visitors and we really enjoyed your hospitality and private lunch /tea and cake. Most of all it was a privilege to meet you. I am sure the charities you support are most grateful for the work that you do. I only hope they appreciate the amount of hard work you put in!" On 13th July the 16 strong group from Hurstpierpoint Horticultural Society came to visit and had a great time. Organiser, Clare Kabza said after the visit, "Thank you SO much for such an enjoyable visit today. We were all amazed and enthralled by your garden; your dedication, motivation and enthusiasm is inspirational. Thank you for being such a wonderful hostthe cakes were absolutely delicious. All the awards and accolades are well deserved. Keep up the good work." 9th July saw the 5th Macmillan Trail and despite poor weather, we raised over �00 from the trail. Visitors still took tea and cake and Clare Mayers, who was taking the gate money found time for a laugh with visitor, Cassie Roberts! On the 4th July, American Independance Day, a coach tour from Philadelphia came to visit the garden. 13 visitors came and saw the garden on a warm but overcast day! To mark the occasion I had made a special cake for them! On the 29th June, we had a return visit from Hilliers Garden Group, through Brookland Travel in Poundbury, Dorset. 34 visitors came and saw the garden in windy, rather cool weather. On the 27th June Alex Reece and Paul Viant from Coast magazine came and spent the day shooting the garden and the cakes for an 8 page feature in the magazine in the Summer of 2017. Alex said of the day, Thank you! It was a real pleasure to meet you all and to see your garden today, which is a truly uplifting and inspiring place, thanks again for a great shoot and the incredible cake!. On the 24th June we had a coach tour of the Geertruidenberg Garden Club from the Netherlands! The coach of 48 was split between 8 Sandagte Close garden and Driftwood so we had 2 groups of 24 who enjoyed a talk about the garden before looking around and asking questions. The Garden Tags team used Driftwood on their banner, posted outside the Gardeners' World Live Show at the NEC in Birmingham over the weekend of the 18th and 19th June! Looking good in the bottom left hand corner! There were great diary listing in the July issues of both The English Garden Magazine and Gardens Illustrated Magazine for the Macmillan Garden Trail, both including an image of Driftwood. On the 9th June we opened for the first of 4 dates for the National Gardens Scheme and had lots of visitors on a beautiful sunny day. The visitors on the right were form Morecambe and were celebrating the ladies 80th birthday! We even managed a candle in the cake. On the 2nd June we had the first visitors for 2016 with the Rainbow Group from Eastbourne. 16 visitors enjoyed the garden, not to mention the tea and cake. Although the sun did not shine a great time was had by all. On the 5th June the first public day with the Mayor's Garden Trail, both Mayor, Lindsay Freeman and local MP, Maria Caulfield were on hand to cut the ribbon. During May the garden has really started to come together, ready for it's first visitors on the 2nd June. Friends kindly gave me a new rose for the garden, aptly names I Am Macmillan. I was extremely pleased to learn that, after entering the image on the right for the M&G facebook competition, it won me a pair of tickets to see Chelsea Flower Show! Even better I was subsequently told the the image had creative stand-out and was being used in their promotion for the show at both Victoria and Waterloo railway stations. Finally at the start of May I was able to go and buy the annuals and had a car load to sort out. All the area at the back of the house was the first to be planted up. Over �0 worth of bedding plants were purchased along with �0 of new perennials, to replace the many damaged by the salt winds over the winter months. An amazing total of 720 new plants were planted out in total. The bed at the side of the house received a real beating over the winter too and all the heather has had to be removed and the area replanted with the addition of a metal wheelbarrow donated to the garden too. The winds through the winter devasted the central part of the garden and the area beneath the central path, on both sides, has had to be replanted for the season. Spring was very late in the garden this year, with many daffodils not showing their faces until early April. The gorgeous hyacinths appeared quite late too. This months sees a concerted effort to get the garden ready for the 1st June. First major task to pressure clean all the hard surfaces. On the left the box courtyard patio before the pressure cleaner had it's way! On the right the area complete with the box topiary. With the removal of the scaffolding in mid March, the views of the garden from the new office balcony window are amazing. Here you can see a shot taken after most of the covers were removed from the plants. It is starting to look like Spring out there now! When the office was being decorated by Aaron from Brighton Paintworks he generously donated the anchor on the left to the garden. When he learnt some of the background and that my grandfather's fish crates were part of the front beach plot, he asked if I would like a large buoy to add and then took the trouble to paint on the company logo my grandfather used! At the start of the month I bought a new conifer at Wisley, Crypt. japonica Sekkan-sugi along with 2 bargain standard olive trees in the local Morrisons, pictured left. I started to order some new plants and you can see on the right the Crambe cordifolia or greater sea kale, ballota pseudodictamnus or false dittany and bupleurum fructicosum or shrubby hare's ear ready to plant out. On 9th March I had a phone call with one of the producers of Gardeners' World about the possibility of the garden being featured on the show this Summer! Everything is crossed!. My latest blog on Storm Imogen for Thompson & Morgan was posted on 11th March and can be read here. A blog I've written about opening your garden for charity was posted on 13th March on Richard Jackson's garden website and can be read here. The delivery of "Flower Power for the summer arrived this month, courtesy of Richard Jackson's Garden. This will replace the Miracle Gro I have been using to date. So generous of him to give me the product for the whole year! Read all about it in my blog on their website. The winds have been really bad during the month and many of the fleeces on the plants have been torn by the weather. The loft conversion, creating an office for me overlooking the garden, is taking shape and this view from the scaffold, will be the one I will have from the large velux window being installed! I took an interesting picture of the front garden from the scaffolding this month as you can see on the left. The garden flyers came back from the printers ready to start distribution. During the month I was invited, along with Christine Walkden and Michael Perry, to write a blog on newly launched blog web site Garden Tags. Entitled "Gardening Connections Can Spark A Growing Revolution". You can read it here. Halfway through the month we had our first and probably last fall of snow across the garden. It didn't last long as it was quickly followed by rain. This month, I had 2 great blogs published, one for Thompson & Morgan and one for Richard Jackson. More importantly, the magazine Coast confirmed that they would shoot the garden this summer and interview me for a feature in 2017. There was an amazing rainbow over the garden this month but we could not find the pot of gold! This month I was invited to have the garden included in the Gardeners' World 2 for 1 offer. This means we will be featured on their web site from April 2016 to April 2017 and in the hand book published in May 2016. To round off the year I posted these 3 summaries on social media on New Year's Eve. Since last month I have been posting a Weather Watchers report on the BBC weather site and on 14th December, images I had posted were used as the backdrop on all the BBC SE Today weather broadcasts. You can see the lunchtime clip by clipping the image. In the run up to Christmas I put a small potted Christmas tree in the garden and decorated it with food for the birds! The tree features in the Christmas issue of Garden News too. In early December I was approached by Richard Jackson, who's web-site had just been awarded gardening web-site of the year by the Garden Media Guild. He wanted to know if I would write a monthly blog for the site! Needless to say I agreed and the first of my blogs appeared this month on the 8th December. Click logo on right to read them. On the 23rd November we had the first frosts in the garden, the temperatures have really gone down now after the milder time through October and early November. Good job all the palms had been fleeced for the winter. In November I was given a pair of cut up gates by a friend who tidied them up for me by cutting off the skirt at the base and the metal frames at the side! 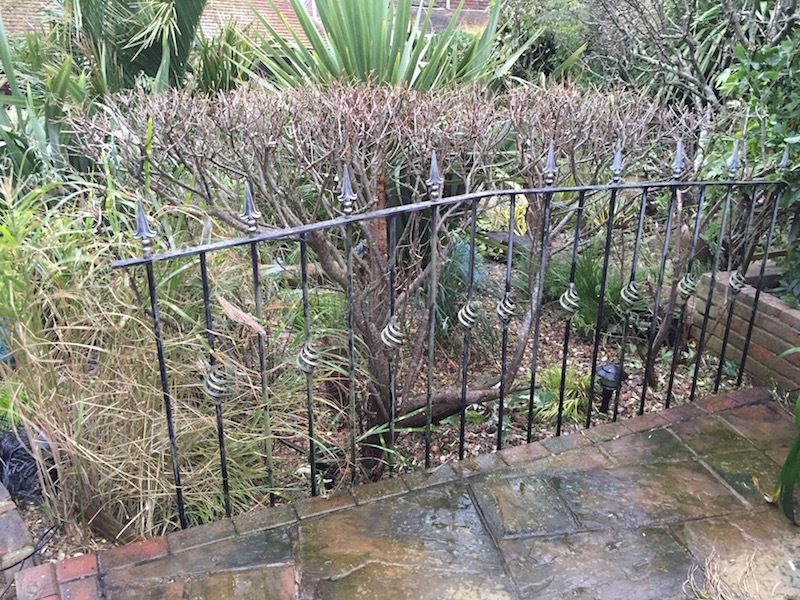 The result, a gorgeous metal divider at the top of the garden which I installed this week. Although it has stayed warm I decided I had to fleece the more delicate palms in the garden. Late last year the gardening charity Perennial decided to include an image of the garden in their 2016 calendar and the picture is featured for August! You can order a copy of the calendar here. On 1st of the month tidied the left side of the garden. Cut back the buddleja, salvia, lavateria and the clematis to tidy the area up for the winter. Dug out one bed too and put pots there until the spring. Much time has been spent tidying the garden for the winter. The grape vine on both the shed and the garden studio have now been trimmed back along with the hedges too in front of the studio, here are the before and after images of the studio. Spending much time sorting the garden out for the winter and removing many of the annuals which have died. The area around the central steps really starts to look very bare! The chrysanthemums start coming into their own and look amazing. This month I teamed up with Richard Jackson who produces Flower Power. We will be using this plant food product in 2016 to feed the garden! October has been so mild I have not wanted to put the garden to bed! I've had to start somewhere though and have moved the succulents to the greenhouse and started to pack things away in the Summer House! 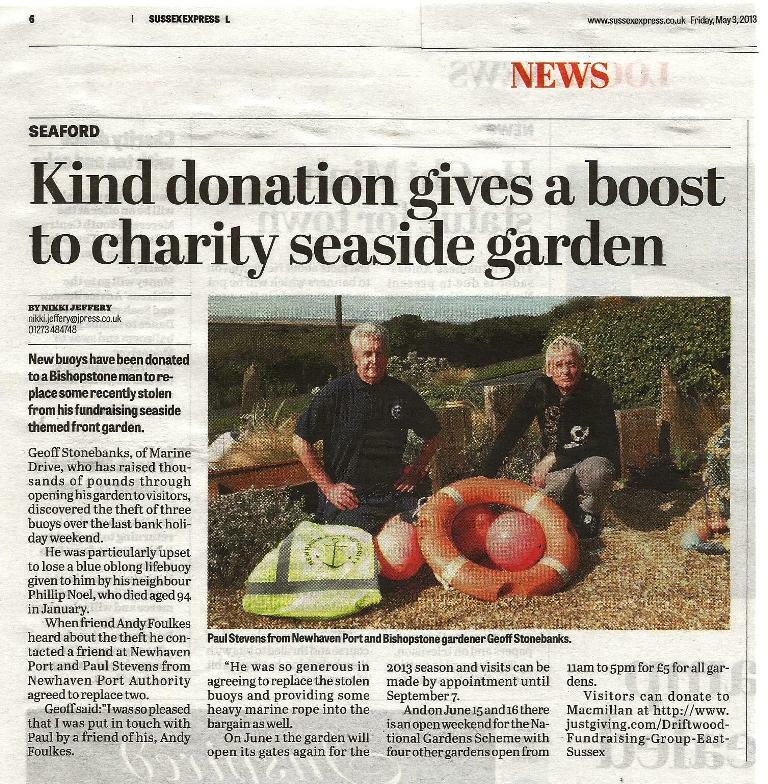 On the 5th October, The Argus printed a wonderful 2 page, centrefold feature, about my charity fundraising over the years. It was a lovely piece, well written by Flora Thompson from the Argus, which can be read online too. On 29th September I was invited to meet the Chief Executive of Macmillan Cancer Support, Lynda Thomas, at the Macmillan Horizon Centre in Brighton and discuss our fundraising with her. 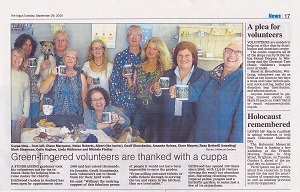 I decided to hold a tea party for all the garden helpers at Church Lane Tea Rooms and on the29th September The Argus featured a photo and article which you can read on-line here. On the 18th September we were invited to an awards presentation in Lewes for the Artwave Favourites awards and were extremely pleased to discover that the public had voted for us as the favourite town venue for the recent Artwave Festival from over 100 venues. Tiring week following the last opening, tidying up the house and particularly the kitchen! All the vintage china, washed and stored in sealed containers in the shed for 2016. There have been such warm days that there have been many bees in the garden. On the 6th September we celebrated the 100th opening on the final day of Artwave and the 4 on the left were the 100th visitors that day and received free tea and cake and a bottle of bubbly! Macmillan came too and Tom Carter was handed a cheque for �00. The Lewes District Artwave Open House Festival ran from 22nd August to 6th September and we enjoyed 820 visitors spending over �000 on the art on show and raising money for Macmillan. Gina Coleman on the left had read the Telegraph article and came to see the art and the garden. She then posted a comment on TripAdvisor about her visit which was amazing. "Saw an article about this garden in The Telegraph last week and knew I had to visit. It happened to be rather good weather today, but even if it had poured with rain I would have enjoyed every moment I spent there. For me it was worth taking a bus to my nearest station, a train to Clapham Junction, another train to Brighton, and then a bus to the garden. I will do it all again next year because it is such a delightful place." A wonderful feature about me and the garden written by Francine Raymond appeared in the Sunday Telegraph Living Magazine on 23rd August and posted on line on 1st September here. 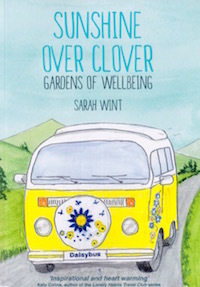 On the 21st August, Sarah Wint arrived in her yellow Daisy Bus as part of her country wide visit to gardens which open for the National Gardens Scheme. She could not make any of our 4 openings so came before Artwave and will be including stories from me and the garden in a blog and book she is writing! On the 19th August Jean Vernon another journalist from the Telegraph posted a wonderful blog about her visit to the garden at the beginning of the month. 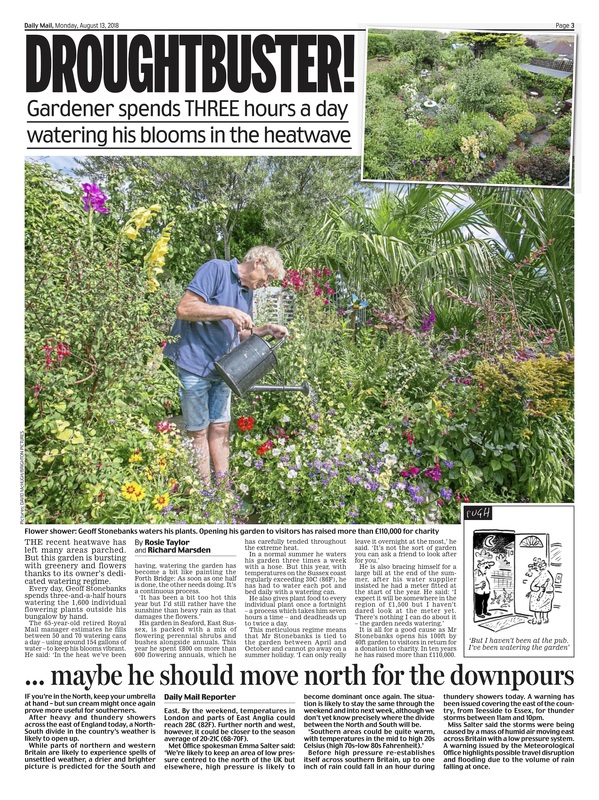 On the 11th August we had a visit from the Rotherfield gardening group who spent nearly 2 hours looking at the garden while the following day, on the 13th, the Telegraph sent Heathcliff O'Malley to shoot the garden along with Francine Raymond to write the feature. It should appear 23rd August and an image of the garden may be used for the cover of the Living Magazine Supplement! On the 11th August we had a visit from the Ringmer gardening group who spent nearly 3 hours looking around the garden and enjoying home made tea and cake! Organiser Marilyn Lineham said after visiting ""Thank you so much for sharing your fantastic garden with us this afternoon. I am sorry our group was so small, but rest assured we all had a great time and will doubtless be telling all our friends about it. I was particularly grateful that you gave us so much of your time in spite of your extremely hectic weekend and forthcoming group visit tomorrow. August is a difficult time in a garden I always think, it certainly is in ours, but you had so much of interest going on in yours. We came home brimming with ideas, just how we will put them into action remains to be seen." August 9th saw the final opening for the NGS and it turned out to be our busiest day ever with 279 visitors. We raised over �00 through the day! In the afternoon Graham Barber was playing vintage music from the 1920's to the 1940's and we even ran out of cakes and had to go and buy some from the shops to make sure all who wanted cake could have it! On 2nd August we opened with 39 Marine Drive, for the RNLI in Newhaven and jointly raised over �0 for the charity. The couple on the left travelled all the way from Poole in Dorset to see the garden and those on the right from Bingham in Nottinghamshire! 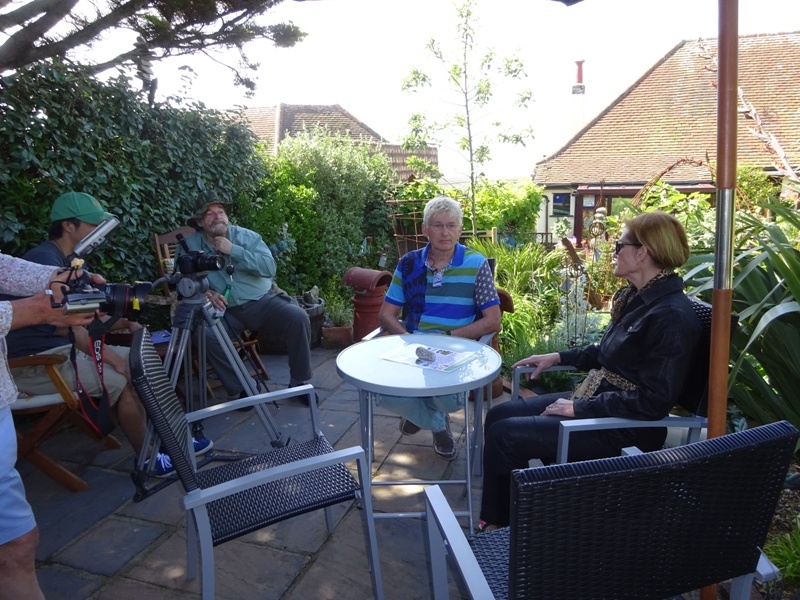 Towards the end of July the team from "Best In Sussex" came to shoot the garden for inclusion on their web site. Our entry canbe viewed here. On the 25th July Tv Gardener, Christine Walkden was on hand in the garden to open the Macmillan Garden Trail and is pictured with me in the garden and with my mother, Barbara, and helper Linda Wallraven. The weekend was a great success, depite the weather and we raised over �00 from just the Saturday as it was a washout with the rain on the Sunday. Rachel Matlock posted a lovely comment on twitter on 23rd July! On the 16th July 5 ladies from Bexhill booked to have lunch in the garden and spent a lot on garden decorations too! The garden was looking particularly good too as the picture shows. 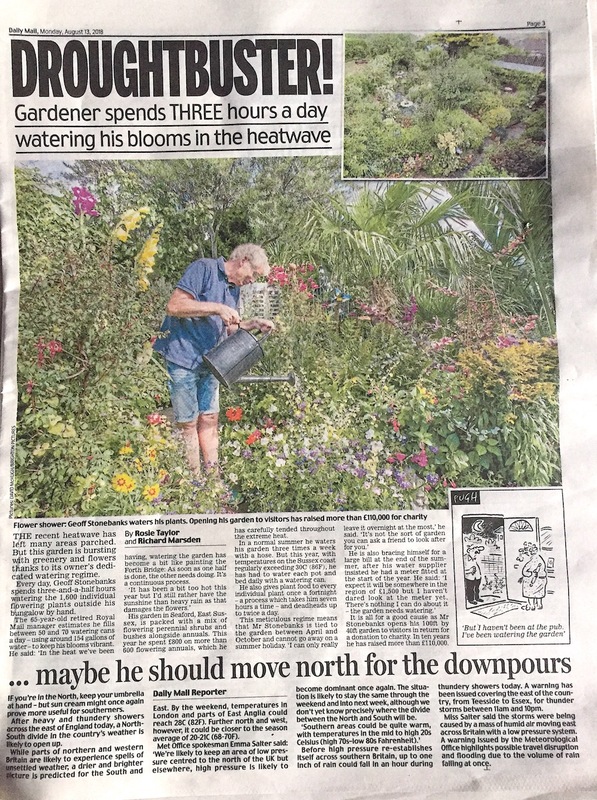 July got off to a great start when I discovered that the Daily Mail had launched it's National Garden Competition on line with an image of my garden! Then on the 9th a group from Surrey came to see the garden and the organiser wrote later and said ho lovely the trip was. Joan Pullman wrote, "Many thanks for your hospitality, tea, talk - and of course your fabulous garden! I think we were all stunned by it and by your achievements, it is amazing! I can see how devoted you are and that, plus all the money you have raised for charity by your hard work, is incredible. I hope the opening next week with Christine Walkden goes well - I'm sure it will. I wish you all the very best for the future - for you and your beautiful, quirky garden. It was a pleasure to meet you." The month ended well with a great article in in Daily Mail Weekend Magazine on the 27th June and also Mail Online. 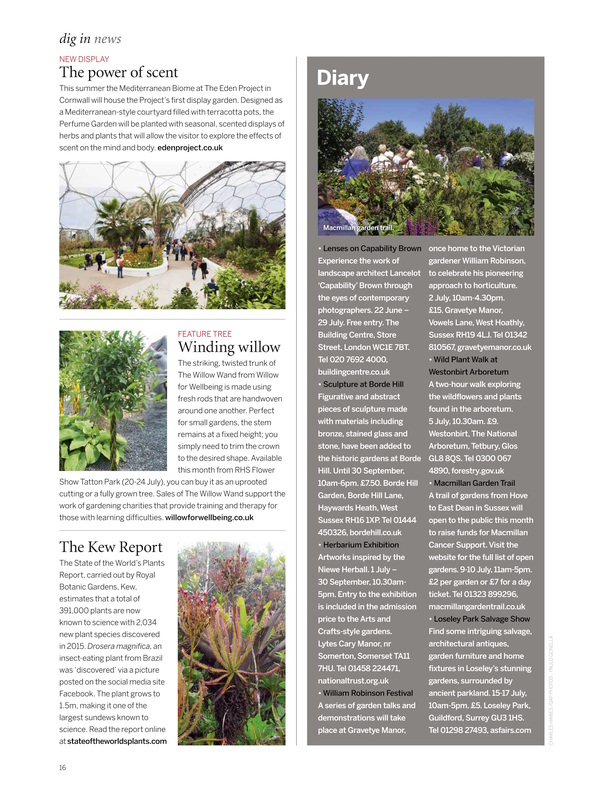 We also had a great piece in Garden News Magazine too. The 25th June was a busy day for the NGS, raising over �0 again on a beautiful sunny day! 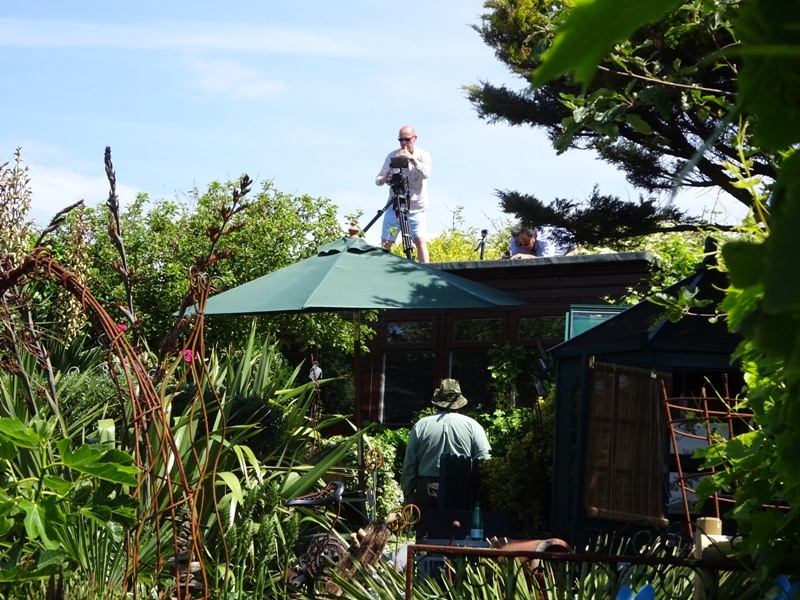 An American film crew were in the garden all day making a film to use as a promotional tool in the States to encourage visitors to come to the UK and see NGS gardens! Cameras were set up in the garden and I was interviewed at length about my involvement with the NGS and my own garden development! The 21st June saw local MP Maria Caulfield and BBC South East Today's Natalie Graham in the garden to officially open the 4th annual Mayor's Garden Trail. A great time was had by all and we even had visitors drive all the way from Portsmouth to see the garden. 9th June saw the first garden opening of the season! Linda Wallraven and Liz Holland were on hand to welcome visitors and sell the raffle tickets for Macmillan. We raised a total of �3 despite the chill in the air with a cold north east wind! The intrepid couple pictured on the right had driven all the way from Bournemouth to see the garden and others had driven down from Surrey too! The 2 red poppies bought from the sea of poppies at the Tower of London look really good in the garden for the summer. Marcus Harpur, garden photographer spent the evening of the 4th June and the morning of the 5th June shooting the garden! Fingers crossed he can get them published! Constance Craig Smith, a garden journalist from The Daily Mail Weekend Magazine, came to interview me on the 3rd June for a piece she is writing that will be published in early July! She sent a great tweet after the visit! The garden looked great when she was here as the green folly door bears testament. Towards the end of the month the summer house was cleaned out ready for the first opening! The collection of osteospermums received from Perfect Plants are looking amazing in the pot in the garden too! These three images were taken from the flat roof at the back of the house on the 17th May, just before the first 4 visitors of 2105 came to see the garden! On the 16th May we went to see an interview with Monty Don and managed to get a photo with him and he signed a copy of the Daily Mail Weekend article when I was in the final 4 of the garden competition that year! On the right the green folly door starting to come good ready for the first openings next month! The new Sorbus or Swedish Whitebeam tree started to produce leaves this month and will look great once out in full. All the gravel beds are getting a tidy up too! Here I am on my knees under the pear tree tidying all the leaves and debris from the gravel. 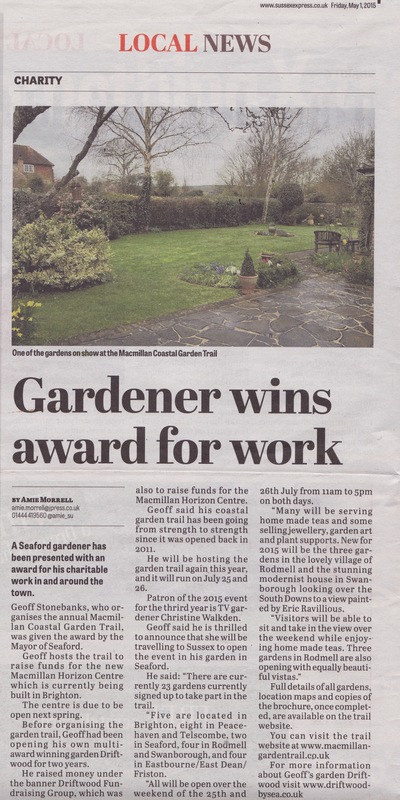 On 1st May, Sussex Express published an article about my winning the award from the Mayor of Seaford and updating the new gardens opening for the Macmillan Trail in July. The last of the tulips are still looking amazing in the garden too! 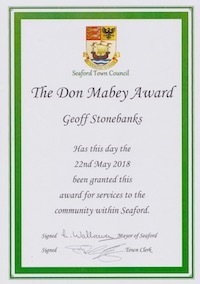 On the 28th April I was invited to a ceremony by the Mayor of Seaford! I was very pleased to be awarded this lovely glass award for all the charity fundraising I have done through opening the garden and organising the Mayors Open Garden Trail! The garden really started to come alive after all the bedding plants were put in and it really felt like summer was on the way! Towards the end of the month I went to my usual nursery in Herstmonceux to buy all the annuals I need to get the garden ready for the summer! You too can get your plants from them via their on line nursery! All I need to do now is find the time to pot up and position them all in the garden! Why not try Perfect Plants? April got off to a great start with professional garden photographer, Marcus Harpur indicating he would like to come and photograph the garden in June! @driftwoodbysea And I am really looking forward to it as well! Keep my updated with when will be your fav time and I will be down there. Begun to get the garden funriture and ornaments out of storage ready for the summer! The lovely windmill given last Autumn by Sarah Stonehouse, has found it's home. The plough has ben relocated and the green table and chairs brought out! It's starting to look quite neat and tidy! Just need the plants to grow now! The last weekend of the month was quite mild and a lot of time was spent in the garden. All the Agave's that had been over wintered in the side alley were put back in the garden. The dianthus were all planted up in the border on the left of the main path! A few more to be added when they are delivered. Inspired by Christine Walkden earlier in the year, on The Great British Garden Revival, I ordered 9 dianthus to plant along the central path this summer. They arrived on the 25th March and will be planted out soon. Equally, the regal pelargoniums that Tom Hart Dyke inspired me to buy on the show too were delivered on the 26th and some will go in the rusted metal urns once the weather improves! The hard surfaces have all been pressure cleaned this month too, starting with the top of the garden and then working down. I have also had an extra row of bricks put on the dwarf wall on the left of the central path too! I purchased a gorgeous vintage childrens toy horse last Autumn and have now had a bespoke frame made for it. You can see it here vaulting the hedge in the garden where it will be resident for the summer! The camellias this year have been absolutely stunning as the 2 specimens below clearly show. In the middle the new brick wall has now been adorned with some rusted metal along witht he louvred french window mirror and a couple of rusty spiders! Work was started on tidying the area around the pond. I relocated the 2 lengths of wood around the pond edges and positioned the Frances Doherty sculpture at the back as a feature! Several new plants have been put in and it should look great by the time we open in June. On the 1st March there was a great plug on BBC Sussex's Dig It, with Joe Talbot for the 20 minute live studio interview I had on 6th March which can be heard here. The new plants arrived to fill the gap in the hedge, where 2 olearia shrubs had died. I could not get any established olerias so replaced them with pittisporum tobira instead! I planted some new grasses and shrubs in the front beach garden too. 2 rosemary plants, officinalis albiflorus Lady In White and Rosea, along with several new grasses, including Imperata cylindrical Red Baron, Chasmanthium latifolium and Pennisetum Thunbergii Red Buttons! The area will take on a new look once these new specimens take hold! I received 70 images of the front garden this month from Dutch photographer, Maayke de Ridder, who had completed the photo shoot last August! One of them was this portrait of Albert and I. Other images of her work can be see on the garden images page of the site. I learnt this month that an American is due to visit the garden in June and include it in a short film being made for the American market to try and encouage Americans to come and visit the UK. We also heard that a lady called Sarah Wint will be touring gardens this summer getting garden owners experiences of opening their gardens to write a book in support of the NGS and we are scheduled to be included in that too! So, lots happening this summer. Sunday 8th was a beautiful day with warming sunshine across the front garden. Spent the whole day tidying it up and digging some old plants out. Now need to replant several areas once the weather warms up! Lots of new grasses and some rosemary to come! Constance Craig Smith, a journalist with the Daily Mail and Weekend Magazine, tweeted she will be in touch about a feature on the garden this summer! We had our first sprinkling of snow on the 6th February and there was a bitterly cold wind! I managed to get on the roof of the shed and fix the brush matting against the trellis to help screen the road and houses. Works quite well but still lets the wind blow through! Builders came at the start of the month to replace the fence on the right side of the garden and erect the bespoke trellis to screen the road from the garden where the tree used to be! Needs covering with brush matting now! Tidied up the corner of the patio at the back of the house and replaced the brush matting! Travelled in to Brighton on 1st to Seedy Sunday and met up with Macmillan Trail patron Christine Walkden who was there. Nice exchange of tweets after the event which you can see below. @driftwoodbysea Thanks yes back safe and nice seeing you . See you in the summer if not before. A friend had a gorgeous windmill made by her father many years ago and when he died she wanted it to go somewhere where it would be loved, so it's ended up at Driftwood and will look fabulous in the garden this summer! At the end of the month the weather improved enough to be able to start tidying up and on the right you can see the area by the pond after some hard work! The new wall looks great with the mirrored louvred window installed and the fireplace will look great once I get a grate and plant it up with flowers beneath the mantel! In mid January we had some horrendous gales with very high winds and lots of rain! Here you can see both the front and back gardens being lashed by the bad weather. The year got off to a great start! The Crowborough U3A Gardening group who had visited last year had invited me to do a talk on the garden to their members. So, my first garden presentation was made to them on the 8th January and thankfully, they were extremely complimentary about the talk! If other gardening groups are interested please let me know! Part of the presentation shows before and after shots in the garden which you can view here . In April 2014, William Bracey, a facebook friend from Arlington in Texas, saw two images of daffodils in the garden and decided to paint them! Here you can see the finished product and they were very generously posted to me and received this month! We had the most successful year to date in the garden with 2227 visitors and �000 raised for charity and nearly 300 visitors who came by appointment! I saw a competition on Twitter last week and entered 3 images that reflected "Beauty In My Garden", as shown on the left and it turned out that I won 1st prize of � and chose the wall weather station for the garden along with a new trowel! Thanks to Two Wests & Elliot for the prize! 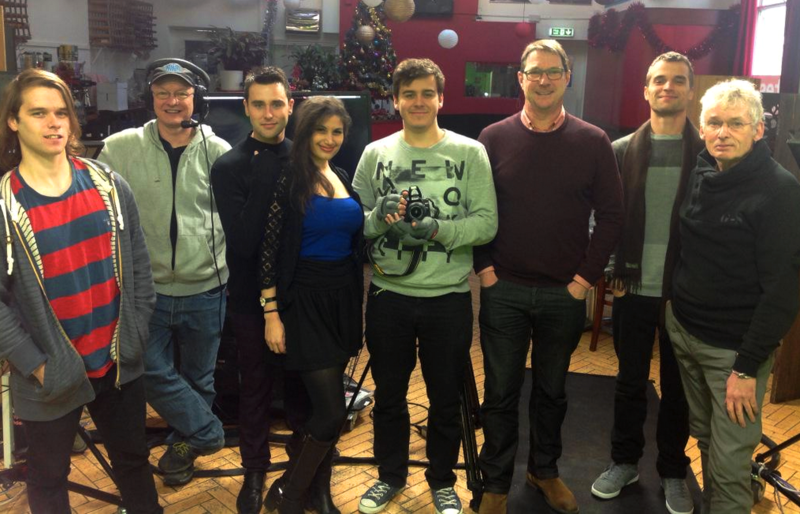 On the 16th December the final Latest Homes Live Show was filmed and I was invited to be in the studio. The last garden segment was shown with Andrew and Simone learning how to make a wreath with cuttings from the garden. The crew and I were snapped after the show. If more sponsorship is gained the show might return in 2015. Wishing all garden visitors a very Happy Christmas for 2014. We had a great day making the wreaths and the decorations back at the house and the team also took footage of the Christmas decorations in the house for a Christmas special sequence of Christmas at Driftwood to be shown on Latest Homes Live before Christmas! 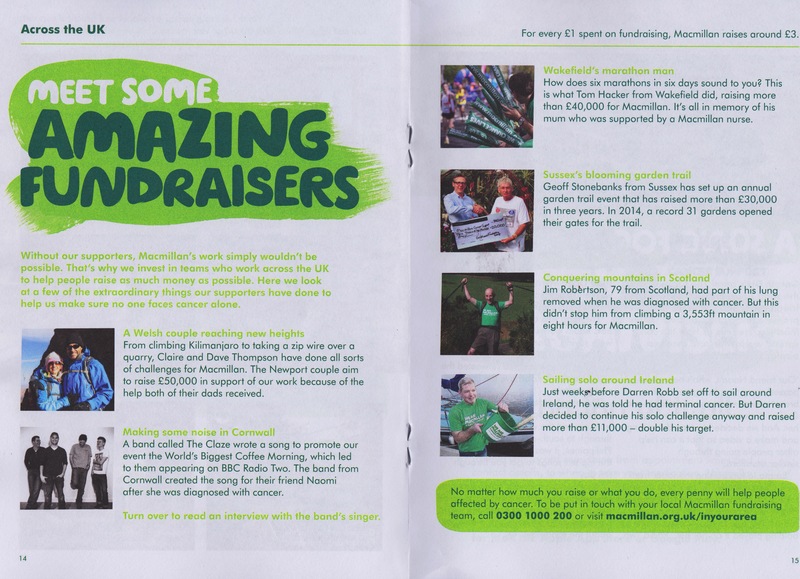 Macmillan Cancer Support published their quarterly magazine, Mac News, in December and Geoff Stonebanks was featured as one of 6 "Amazing Fundraisers" for the charity which was fabulous to see, you can read it here . On 25th November the builders removed the old fence and started to replace it with a 7 foot brick wall between the tree and the shed and new fencing to the end of the garden. The front garden had a final tidy up for 2014 and still looks quite amazing. So many summer annuals are still looking good in the garden as well! This month a 30 minute podcast was published on iTunes, by Dave Ledoux and Back To My Garden, about my gardening experiences since moving from London to the coast in Sussex. You can listen to the interview here . A facebook friend, Peter MacNaughton, made this comment after hearing it: "Heard an interview you did with Dave on Back To My Garden; you're inspiring! I am buying a house this summer and have a space roughly your size with a different challenge: I'm in Saskatchewan, winters are long and horrible....so the growing season is short, and important to gardeners and plants. Will keep an eye on your page!" On the 13th November my latest blog for Thompson & Morgan was posted and they tweeted it. You can read it by clicking the link in the tweet! Winter seems to have set in quickly! Bad winds and drop in temperatures has meant the palms in the garden have been fleeced until the spring! Despite the warm weather and the last day of October being the warmest on record, I have had to start taking out the annuals and tidying the garden ready for the winter. The back patio was first on the list and you can see my efforts in the 2 images! On the 30th October, the Latest Tv crew with Andrew and Simone came and filmed another 7 gardening segments for Latest Homes Live show and we had a great day as the weather was so gorgeous! Busy time cutting the garden back. On the right cutting the New Zealand Flax, phormiums, at the top of the garden and on the left trimming the top of the Sea Buckthorn tree on the left of the garden! With the removal of the tree in next doors garden back in September I needed to find a way to screen the road from the view of visitors on the left of the garden! Stage 1 has been the planting of a Sorbus Intermedia Brouwers. As you can see, once in leaf it will go some way to obscuring the road. Stage 2 will follow later this year or early next! The greenhouse was given a thorough clean in the middle of the month too! It was emptied and all glass cleaned and summer shading removed for the winter! As a safeguard, ready for filming with Latest Tv at the end of the month, I have made provision to film sequences in the greenhouse if wet! Busy week tidying the garden and cutting back the New Zealand Flax in the gravel beds near the summer house. Here you can see the before and after images of one of the 3 plants. Great session today with Cameron and Emma from a TV Production Company who were here to film me and the garden to help them get a new programme commissioned for BBC 2. Fingers crossed might be in the show itself once commissioned! They interviewed me about my passion for gardening, how the garden has been created and developed and how I might feel about designing a garden for others?????? Watch this space! Latest TV, Andrew Bullock, Simone Thorogood and crew, Ant and William, arrived on the 3rd October for filming some sequences to include in Latest Homes Live over the next few weeks! See all the videos by clicking here. The garden was starting to look very untidy, so cut back the shasta daisies by the green table and it started to look quite good again as you can see! It needed to be tidied ready for the Latest TV crew when they visit on Friday 3rd for filming! The film made during the Macmillan Garden Trail was aired on Latest Homes Live on the new Brighton TV channel in September and I was invited in to the studio to talk about the event! You can see the clip here. Following on from this, the team will be filming several sequences with me in the garden to air on the show throughout the winter! On Friday 12th, the neighbours decided to cut down their tree which has a major impact on the garden! Here you see before and after. It's amazing at the increase in traffic noise without it! Views from the patio half way down the garden on the left have been taken away as now you can see the road!! Fabulous last day of Artwave presenting a cheque for �000 to Rob Moon from Macmillan! Read the great piece in Sussex Express on the 12th September here . Great tweets from Macmillan's Regional Fundraising Manager after receiving the cheque for �000. @driftwoodbysea Always a pleasure, the garden looks great, the cake was lovely and the �k amazing! Thanks so much Geoff. and from Macmillan in Sussex on the final garden opening day for 2014 for Artwave and raising money for them! The final weekend of the Artwave Festival takes place over the weekend of the 6th and 7th September! Rob Moon, Regional Fundraising Manager for Macmillan will be here to draw the raffle and be presented with the cheque of monies raised by Driftwood Fundraising Group this summer. Prior to arriving he said "It sounds like you抮e having a fantastic summer and breaking all records! I抳e tried to keep up on twitter but you抮e so hot on there that I抦 sure I抳e missed a few tweets, although what I抳e caught has been brilliant � it抯 such a great way of getting the message out there. Add in all the other press you manage to secure, plus the feature on Latest TV and you really are a true superstar fundraiser, I can抰 thank you enough for everything you do. Please also pass on my gratitude to all the garden owners, artists and all the other people who help make this such a success. Ten thousand pounds takes us another big step towards opening The Sussex Macmillan Cancer Support Centre and will make a huge difference to people across Sussex affected by cancer. Again, thank you and I look forward to seeing you on Sunday. Let the sun shine!" The two ladies on the left had planned a break in Sussex specifically to see the garden and had travelled down from Leeds! Both Maria Swider (left) and Sue Thornton were enthralled with the venue and spent nearly 3 hours looking over both the garden and the art! Both taking a momento back to Leeds! The second weekend of the festival saw good weather but roadworks on the A259 spoilt the Sunday visitor numbers! We have still achieved record sales of art at �31 which is amazing. We still hope to reash �000 for Macmillan with �6 needed over the final weekend! The Lewes District Art Festival kicked off on Saturday 23rd August to an utterly amazing start! Over the weekend we saw 350 visitors who spent an incredible �40 on the 16 artists work in the garden! We also raised over �0 for Macmillan Cancer Support too! Bank Holiday Monday was less forgiving as it rained constantly throughout the opening. In mid August I was approached by a dutch photographer, Maayke de Ridder who wanted to come and take photos of the garden for possible inclusion in a new book on small gardens by Noel Kingsbury. You can see her on the left when she visited the garden on the 21st August! In addition to taking images for the book she hoped to sell them to magazines as well! Also on the 21st August a group of 23 from the Uckfield U3A visited the garden for tea and cake! During the course of the week prior to Artwave, artists were delivering their stock which is in the process of being installed in the garden ready for opening on the 23rd August! On the 11th August a group of social media savvy gardeners, me included, were invited by Michael Perry, New Product Development Manager for Thompson & Morgan, to their trial site just outside Ipswich! A great day was had seeing some new products and plants under development and Michael described us as "influential horticulturists". Over the weekend of the 9th and 10th August the remnants of hurricane Bertha hit the UK and we had dreadful winds across the garden. On the left you can see the shasta daisies were very badly burnt witht he wind and on the right the guunera and the fig tree are being badly blown. It took several days after to get the garden looking reasonable again! On the 3rd August we opened the garden for the final pure garden event of 2014 and were extremely busy! We saw over 250 visitors and raised an astonishing �04 for the NGS, not bad for a small garden on the south coast! Jean Griffin kindly came and gave gardening advice to visitors, seen on the left in the front beach garden! The 3rd annual Macmillan Coastal Garden Trail, which I had organised, took place over the weekend of the 26th & 27th July, with 31 gardens open stretching from Brighton to Eastbourne. A massive �00 was raised for the new cancer centre in Brighton. Here you can see the Mayor of Seaford, joined by the Chair of Lewes District Council opening the trail. On the right Sarah Coxhill from Macmillan watching the ceremony and the Latest TV crew filming it for airing on their new Brighton TV Channel at the end of August! After following up on a tweet earlier this week the broadcaster, Jonathan Kent, came to the garden on the 27th to interview me about the relationship between charity fundraising and the use of social media! Check out the blog he posted along with a copy of the interview here . He will be including it in a piece he is preparing for the Click programme on the World Service. So impressed was he with the garden he intends to add a blog to his Sussex blog about Driftwood, more on this later! On 24th July the Blatchington Townswomens Guild came to visit the garden and as you can see all seemed to have a great time, especially those in the summer house. The Lewes Windmill District Trefoil Guild came to visit in the evening on the 16th July! 14 ladies had a wonderful time in the garden enjoying a mixture of savoury muffins and cake served with tea and coffee. On the 8th July 2014 I applied for the garden to be featured in Good Morning Britain as one of the 5 locations where weather girl, Laura Tobin, would deliver her live weather reports, week commencing 14th July! Amazingly, the garden was chosen as one of the five and was featured, along with 2 short interviews with me on Monday 14th July live! Good Morning Britain posted a wonderful blog about the day at Driftwood on their web site on the 16th July here . You can read all the gossip and see the live interviews here . After a very early start for the filming on Good Morning Britain on the 14th July, Laura and I took a break and were joined by her gnome which had been specially commissioned by ITV but she and shows producer Oliver Breckon had decided to give it to me as a thank you for the hospitality they had received while filming! The Shoreham U3A gardening group came to visit straight after the early morning filming session with Good Morning Britain . We had expected between 25 and 30 but 37 turned up and we almost ran out of cake! They all enjoyed the vist and many had seen the garden on TV earlier in the day. A gardening group from Epsom came to see 3 gardens in Sussex on the 10th July and came to see Driftwood in the pouring rain. Despite the weather Sue Marden who organised the visit said afterwards, "We felt that we needed to thankyou again for our visit to your wonderful garden. We really did all say WOW when we entered the rear garden. I could never call it a small garden because it is enormous in interest and design. So clever and flamboyant! We do appreciate all the hard work you must put in to get it looking so brilliant." What a fabulous compliment despite the rain!! On 8th July the garden opened for the last time for St Wilfrid's Hospice. Whilst it was a lovely day here, the bad weather around Eastbourne seems to have deterred visitors as we were quiet but those that came had a great time in the garden as you can see. I received a phone call from Caroline Donald. Gardening Editor for the Sunday Times, on the 4th July. She wanted to include the garden, with images, in a piece she was writing about seaside gardens across the country! Details and pictures have been sent so fingers crossed for 20th July when the article will be published. We opened for the National Gardens Scheme on the 1st July and it was a beautiful day with over 100 visitors helping us raise over �0 for the NGS. Many enjoying the sunshine and taking tea in the front beach garden! While in Dorset last month I found these antique leaded glass panels fo a bargain! I asked local artist Paul Cox to make some frames for them on stakes so I could place them in the hedge! They now look great! On 25th June a facebook friend, Sacha Hubbard and her husband Ray (above) came to see the garden and she was so complimentary about it! Sacha said after visiting "Whatever you do, if you get to East Sussex, visit Driftwood Garden on one of their many Open Days for the NGS. It's the most staggering and inspirational garden to show what can be achieved without possessing rolling acres but having an eye, imagination, a love of plants and great energy and enthusiasm. This is a real 'must see' garden." The Mayors Open Garden Trail, which I had organised with 9 gardens in Seaford and Bishopstone, opened on the 22nd June and the weather was incredibly hot! The 9 gardens saw over 1300 garden visits from about 190 visitors and the grand sum of �00 was raised for the Mayor's charities this year. The Mayor of Seaford Cllr. Mark Brown and local MP Norman Baker were on hand to start the ball rolling! Over the weekend of the 14th and 15th June, the painting I had commissioned from local artist Sarah Gregson, pictured (also known as Demoratti) was hanging in the Crypt gallery in Seaford before paying for it and having it hung at home! On 10th June the garden opened for it's first of 4 for the National Gardens Scheme and we had 176 visitors and raised �2 for charity. It was a beautiful day and may visitors enjoyed the tea and cakes sat around the garden. This month, the latest update on my commissioned painting of the garden was sent over for comment and it looked great. Can't wait to see the finished product! 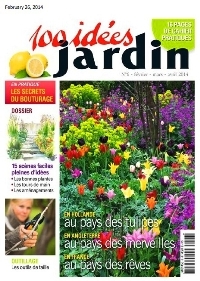 I found out this month that the garden had featured in a french gardening magazine called 100 Id閑s Jardin back in the February-March issue. Jonathan Need who had taken the images last summer had sold them to an agency who had sold them on! 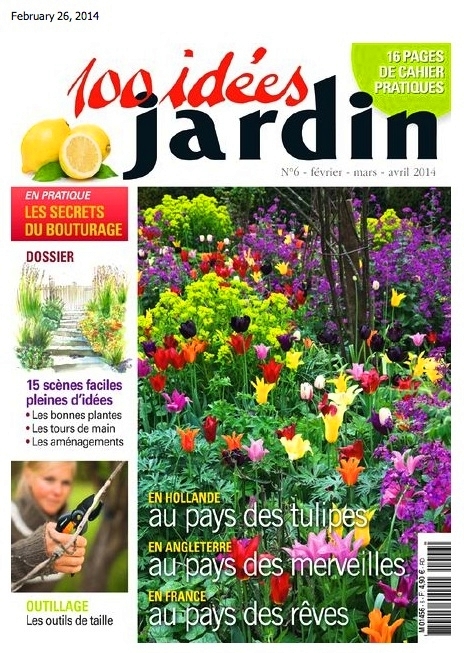 Interesting to read an article about the garden in french with the journalist not having interviewed me! You can read the english translation here . On 4th June I was interviewed by Allison Ferns in the postcard slot on her afternoon show! You can hear what was said here . I was contacted by the production team of Britain's Best Gardens on 2nd June with a view to the garden being featured in the programme! Interview over need to wait and see if we get to the next stage! An email received on Friday 6th June indicated a recce was likely to take place in June with possible filming in July! Amazing, fingers crossed still! A recent purchase from a weekend away in Dorset was this lovely small sculpture on the right of the picture! On 28th May I was contacted by a TV Production company who were considering using the garden in a forthcoming new TV series, fingers crossed they use Sussex and subsequently the garden! On 29th May, Michael Perry, New Product Development Manager at Thompson & Morgan asked whether I would be interested in doing live telephone interviews on Ideal World TV with the possibility of live TV demonstrations as well! Needless to say I have said yes! Watch this space! This month I have commissioned a local artist, Sarah Demoratti,whose style I really like, to paint a picture of the back garden for me! These are the 2 rough sketches she has produced and will paint the finished product based on the one on the right! English Gardens Photographer and Writer, Nicola Stocken said she will be doing a photo shoot in the garden in June, following my contacting her at the start of the year! Regretably she never turned up! On the 21st May I met up with Patron of the Macmillan Trail, Christine Walkden, in between her hectic filming schedule at Chelsea Flower Show. In my capacity as the Publicity Officer and the Asst County Organiser for East & Mid Sussex, I was invited to the launch of the Yellow Book back in April and was lucky enough to meet up with Joe Swift. Featured in the May 2014 issue of Garden Answers as seen below! 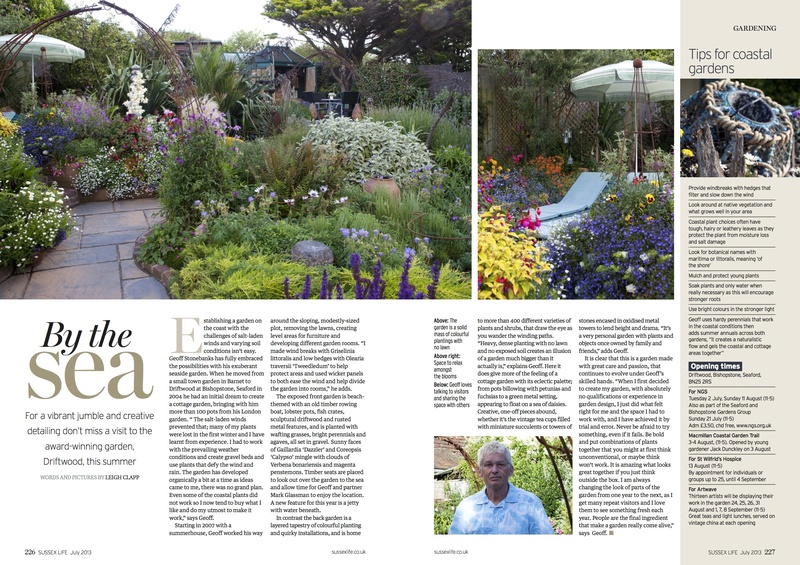 Liz Potter, the editor said in the editorial, after talking about the excitement of Chelsea, " If you're still not convinced, take a look at Geoff Stonebanks's seaside garden on page 54: it's not large, but it's packed with plants and personality!" Really bad winds struck the garden over the weekend of the 9th & 10th May doing a lot of damage to new growth, as seen on the new laurel hedge (right) by the studio! Meanwhile all the bedding plants recently bought from the nursery are all finding homes in the garden ready to launch into a magnificent display for visitors next month! On Thursday 8th May the first visitors of the year came to see the garden along with Coastguard Cottages in Newhaven. Having had lovely weather for the early part of the week the heavens opened on the morning of the visit and continued throughout the visit! Tea and cakes was served undercover in the shed, the side alley, front porch and summer house! What a nightmare, but all still seemed to enjoy the garden and promised to come back in better weather! All the fuchsia cuttings have now been potted on and are ready to sell at the forthcoming openings. All stacked on the shelves ready! All the plants in the garden have had 3 feeds of miracle gro already and are really starting to blossom! I've now started completing all the risk assessments of the 29 gardens taking part in the Macmillan Coastal Garden Trail this Summer. Towards the end of the month I clipped all the box topiary in the garden back in to shape as you can see! Can't believe I sold some of the Driftwood books too! 2 softback and 2 hard backs! Amazing! One of the trial products sent by Thompson & Morgan last autumn were some tulip bulbs! One variety was Silver Parrot which looked utterly amazing in the garden through some of March and all of April! 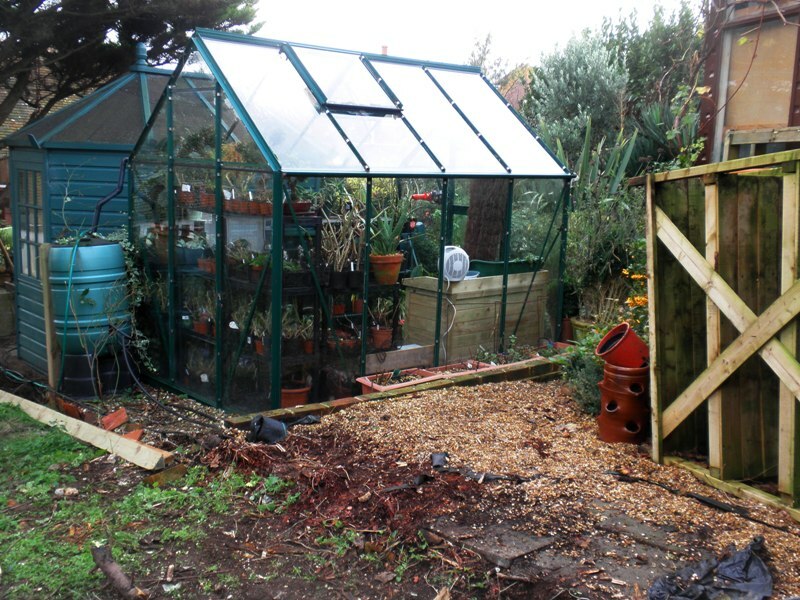 The greenhouse needed a thorough deep clean and was completely emptied on the 12th April and given a good going over before all the plants were put back in! Spent the day on the 3rd and 4th of April with the jet spray machine deep cleaning all the hard surfaces in the back garden, it is all starting to come together ready for opening! Late in March I saw a tweet about a new gardening programme for 2015 to celebrate Alan Titchmarsh's 50 years in horticulture on Britain's 30 Best Gardens so decided to apply! Here the judge, Geoff Hodge, from Garden News, is suggesting the programme makers take a look at Driftwood and they have favourited the tweet! Fingers crossed! We went to London to Columbia Road Flower Market this month and bought many new plants as you can see from the picture on the right. Also acquired was this fun Dutchman and rusted metal trug. Look out for them in the garden this summer! 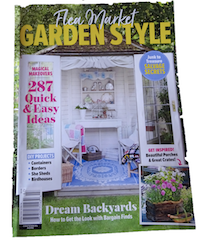 I received a surprise message on 18th March asking if I could be interviewed with a view to the garden being featured in the national monthly, Garden Answers in May! Jonathan Need, one of the 3 photographers who came to the garden last summer had sold his images to the magazine for the feature! So, look out for the May issue in the shops! In the middle of the month I also found out that one of the photographers who did a photoshoot in the garden last summer has sold her images to Saga Magazine and the garden will be featured in it later this year or early in 2015. Below right, as promised, is the boat planter fitted and planted up on the side of the back porch wall so it will be seen as everyone enters the garden! March has been a very busy month, the studio has been sanded down and varnished, the Summer House has had a new coat of sage varnish and the front and side of the house have been repainted too! The first daffodils sprang up in the middle of the month as well! This year the 3 camellia shrubs in the garden, white, rose pink and red have been the most beautiful I have seen since moving to Seaford! These two look quite amazing! Spent the day on the 4th tidying all the patio at the back of the house and getting pots in position ready to plant up with some colour later next month. On the left a new vintage wire rack stacked up with old terracotta pots has found a new home. On 22nd February an article appeared in Garden News about what you would take with you from the garden when you move house? 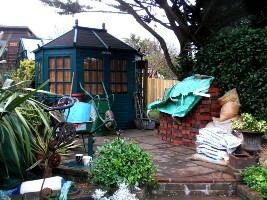 I sent in images of my garden in Barnet, N. London before and after moving day back in 2004. Photos of plants in that garden and those that are still in the garden at Driftwood still, 10 years later! My response made letter of the week in the 8th March issue. I won a lovely book Two Dogs and A Garden only just published! Above are three shots of the garden taken on the 2nd March showing the cottage garden area on the left, the main pathway in the centre and the pond area on the right! Not looking bad after all the bad weather thrown at it recently. As spring approaches, two stunning flowers in the garden, on the left the bergenia in the beach garden at the front and on the right one of many camellias in the back garden. A local Women's Institute Group rang on 25th February to make a booking to visit the garden in July. This brings the total of private bookings now to 150 visitors. Managed to position the rustic french shutters I had bought last Autumn in Dorset. They give some real height and drama to the upper patio. Once fully planted the area will look stunning! The area to the right of the summer house has now had the matting on the fence replaced and the french effect shuttered mirror window set up on it! Just the window box to plant up! On 21st February I tidied the whole area around the pond which was looking very sad! Planted some new conifers at the back along with some other new plants to brighten it up! Also cleaned out the pond and removed much of the mud on the bottom! The meadow grass banks at the front of the house have had their annual trim! The marine rope, once used to tie up ferries in Newhaven Harbour has been repositioned and now awaits the sea kale growing up to finish the look! There was a beautiful sunny day on the 16th February. Busy day catching up! The escalonia hedge in front of the studio was infected with leaf spot last year but too late to take it out before we opened! So, it had to come out this year and you can see the before and after here! The new laurel hedge has been planted after the studio had been sanded and painted! The weather perked up on the 10th February so I was able to get out and tidy up one of the raised beds full of fuchsias! Lady Boothby, Lady in Black, Riccartonii and Duke of Wellington! Cleared out the debris from the bed and supported the climbers with the rusted metal frames, here you can see the before and after shot! Amazing how many already have young shoots on! On 6th February, Thompson & Morgan posted the latest blog from Driftwood on their web site. You can read it all here . etc Magazine's Homes & Garden. I was interviewed on the 23rd February! Well! February carried on where January left off with dreadful wind, rain and gales. The garden has really taken a beating but seems to be doing well! On the right, the first daffodils starting to appear in the garden on 4th February! On Monday 27th January I was invited on to the Allison Ferns afternoon show on BBC Radio Sussex, to talk about the Macmillan Garden Trail. We discussed the trail and my seeking to get a few more new gardens to join us! You can listen to the 10 minute broadcast for yourself here. On 26th January I spoke about the NGS gardens opening in February and at the end of the "on air" interview, Joe Talbot gave me a good plug for my own garden too! You can listen to the broadcast for yourself here. The first decent day for working in the garden was the 20th January, all the patio area to the rear of the house has been tidied up and plants in pots trimmed! A new black bamboo, phyllostachys nigra, has been planted in a pot as well! Macmillan have now confirmed that work will commence on building the new cancer centre in Brighton on the 24th February 2014. The garden has raised over �000 which has gone directly to this project! They say " We are well on track with fundraising, with the generous support of the local community, funds in hand for the Sussex Macmillan Cancer Centre already stand at �43m. But we need your help now to raise �27m" More money will be raised in the garden in 2014! Learn more about the new centre HERE. In the 1st edition of Garden News for 2014 they launched a competition and used an image of Driftwood and mention of the garden fundraising in the article as well. Confirmed in early January that the garden will open in the evening to raise funds for the RNLI on the 11th July this year! More details here . A great year for fundraising, local and national media coverage. Some highlights of the year below. 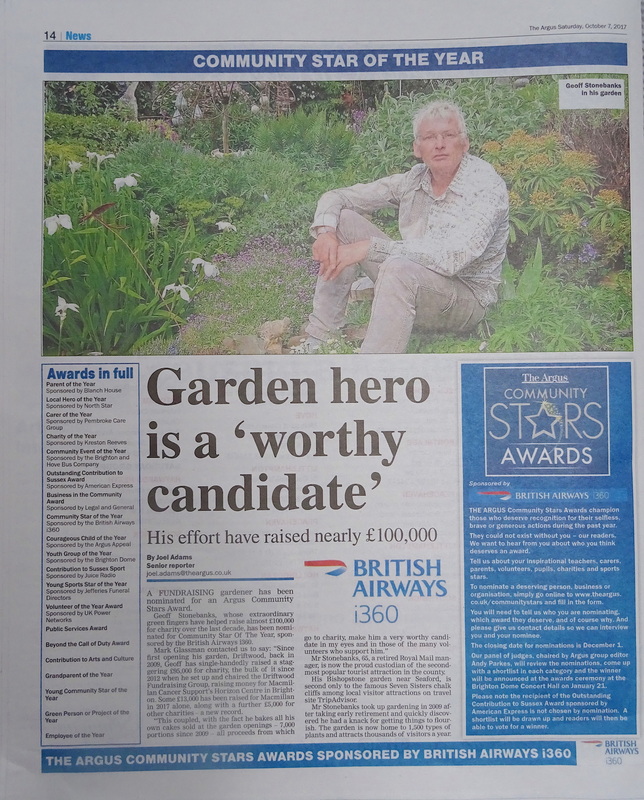 The garden featured in bothThe Mail on Sunday and Sussex Life and was a finalist in the BBC Sussex's Community Heroes Awards. 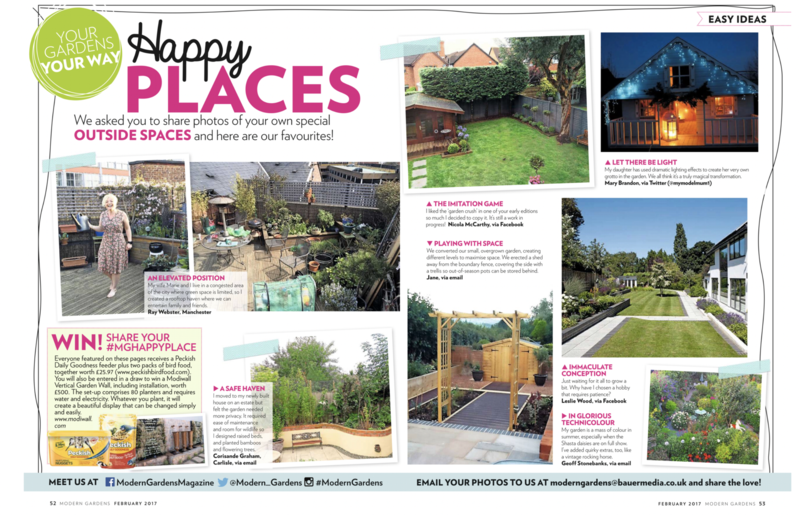 It was the 1st ever 360� PANORAMA garden to feature in the Daily Mail's Weekend Magazine on line, see June below. Throughout the year there was a monthly article for in their "over the fence" Readers' Gardens section, read them all here. There was a regular monthly slot on BBC Radio Sussex's "Dig it" programme on a sunday morning with Joe Talbot, discussing NGS Gardens. Outline TV Production Company visited, on behalf of the BBC1, to film a demo for a Wildlife programme in February and the producers of ITV's "Love Your Garden" programme with Alan Titchmarsh visited the garden on 15th April for possible use in an upcoming programme. Thank you so much to all the 2841 visitors who came to the garden during 2013 and helped us raise an astonishing �775, up 83% on 2012, all of which goes to various charities. Thank you to Yorkshire Tea who so kindly donated all the tea served in the garden during 2013 for the second year running. We sold an incredible 886 cakes and served 812 cups of tea or coffee! Thanks too for your support and to our many helpers, Celia Hughes, Richard Walsh, Clare Mayers, Rosa Bottrill, Diane Marquess and my mother, Barbara Stonebanks, without whom it would not be possible. Here are the fundraising totals to date for the garden events from 2009 to 2013. As part of the run up to the Community Heroes Awards on the 11th December, I was interviewed 3 times on BBC Sussex, with Allison Ferns on the day of the awards here, with Neil Pringle on the BBC Sussex Breakfast Show on Wednesday 4th December, here and with Joe Talbot, on Dig It here, on Sunday 17th November. The Editor of BBC Sussex, Sara David, tweeted as shown on the right following my tweeted comment after the awards ceremony! @driftwoodbysea very worthy nominee finalist in a really hard fought category. Lovely project. On the left, a new painting of a section of the garden by Mark Glassman. On the right the newly installed rope bannister to help visitors up the steep slope and steps at the front of the house. Meet Clarence the cow planter, who has arrived in the garden and will be resident there next summer! Produced and sold by Australian company Think Outside. He is available now, to buy in Hilliers Garden Centre in Eastbourne! The back porch has now been completed with the furniture being delivered early December! All the shelves filled with gardening books! Thompson & Morgan posted a new blog about the BIG BEGONIA REVIVAL on 25th November, including a post by me as well which can be seen here. In order to create more storage space for both plants and furniture over the winter we have had a roof put over the alley at the side of the house! Here you see the finished product, right! Lots of plants already installed to protect them from the winter and some garden tools and furniture under cover now. All the delicate plants in the garden now covered ready for the winter too! With the new porch at the back opening directly on to the path and the double doors giving a direct view on to the garden from the kitchen, it was necessary to dig out the taller plants and replace them with some lower growing ones so as not to impede the view! Here you can see work started to clear the area before replanting which is still to be done! Some hardy geraniums from Thompson & Morgan have been planted in this area along with some gorgeous tulips, silver parrot and ice cream as you can see on the right. On the left the structure of the back porch now in place. Lots of work still to do, flooring and decorating! It's goning to look great once all finished. Just waiting for plaster and floor to dry out before tiles are laid and paint applied! All the large pots have had to be moved around to accommodate the enlarged porch. In late October, this picture, taken by me in the garden, of an Aster Island Series Barbados, was included in an on line album of photographs depicting Autumn scenes put together by the Daily Telegraph. Click name to see the on line version. On the right a fuchsia, one of many plants in the garden devasted by the gales over the last weekend of October. Forecasts of strong winds and gales at the end of October prompted a quick cut back of the vine on the shed! There were lots of ripe grapes on the vine as well. We'll have to see what we can do with them all! On the 23rd October, spent the afternoon tidying the area around the gravel in the back garden! Cut back all the gorgeous shasta daisies and dug out all the bed nearest the house divided the Erodium Mannescavii and replanted bed with some new and some old plants. Looks really tidy now and ready for the winter. Brickwork starting to go in and not long before the damp proof course and then windows doors and flooring will be fitted! 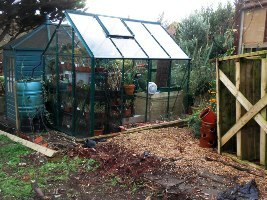 Meanwhile all the greenhouse tidied up ready for the winter. Work started today on replacing the back porch as well, which will make the service of tea and cakes much easier next year! Here today! Gone tomorrow! Pictures to follow when the new structure is finished in a couple of weeks! So far the weather in October has been unbelievably warm! Many of the fuchsias are getting second wind and flowering again like these stunning "pink temptation". These rudbekkia seed heads along with the Buddleja look really dramatic as well. Many annuals that would normally have died of are still going strong! Now the garden has closed I am beginning the changes for 2014 and tidying up for the winter! Many of the annuals are still looking great so do not want to remove them until they have died off! I have had to remove some of the plants to the side of the house and replace them with some cotoneaster horizontalis, seen here. 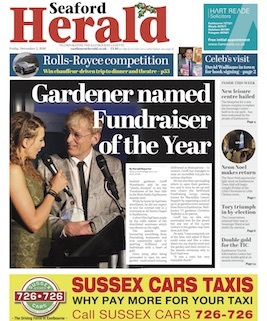 On 20th September, the garden made the headlines on the newspaper hoardings for Sussex Express, seen left! A great article with "chopped" image appeared in the paper that day too! On the left presentation of a cheque to Macmillan for all the monies raised for them in the garden this summer! A massive �00! Read my latest blog, posted on 3rd September, as part of the Thompson & Morgan Customer Trials Programme here. Click the BBC Sussex logo below to hear the fabulous plug for the garden web site by Joe Talbot and Steve Bradley on BBC Radio Sussex's Dig It on Sunday 1st September! On the 15th August, the 3rd professional photographer to visit the garden in 2013, Abigail Rex, came to complete a photo shoot with the hope of getting her work (and my garden) published over the next 18 months or so. In August, Clare Singlehurst, Director of Regional Fundraising for Macmillan wrote the lovely letter on the left thanking me for my efforts in raising money for Macmillan and there was also a nice article and picture of me in the garden, about the work I did with them on behalf of the National Gardens Scheme back in June, in the lead up the the Festival Weekend in a magazine they published, shown right! Great support for the other work I do for Macmillan as well with the Driftwood Fundraising Group which has raised nearly �000 for Macmillan in recent years. On 14th August, Michael Perry, New Product Development Manager from Thompson & Morgan, came to Driftwood to photograph some of the trial plants and other plants growing in the garden, seen here with me! Maybe some of them will make next years catalogue! Our second opeing for St Wilfrid's Hospice was on Tuesday 13th August and we had over 120 visitors come to see the garden. �56 was raised over both openings along with 4 Sunningdale Close, which was incredible. We opened for the final time for the NGS on Sunday 11th August to a very wet start followed by an amazing day with over 200 visitors coming to see the garden and raising �6. Here you can see my mother Barbara, and her friend Edna Bradbury sitting in the porch taking the entry money for the garden! On Saturday 10th August another professional garden photographer, Jonathan Need came to complete a photo shoot with plans to feature the garden in magazines in Germany, Australia and the UK over the next 18 months or so! The first day of the Macmillan Garden Trail was on Saturday 3rd August and we had an illustrious crowd for the opening ceremony! On the right I am joined by Norman Baker MP, Michael Chartier, Chair of Lewes District Council, Sarah Coxhill from Macmillan and "Celebrity Gardener" Jack Dunckley who came to cut the ribbon to launch the trail! We raised an amazing �16 from the trail for the new cancer centre in Brighton which was incredible! Raffle winners to be announced once the draw is complete later this week or early next! The Galloping Gardener, Charlotte Weychan, visited on Friday 19th July and wrote a great blog about her visit and how impressed she was with the garden, check it out for yourselves here. Her friend, Ronnie Tyler, also a blogger on gardens did the same and produced this lovely blog with images of the garden set against a poem by John Masefield, take a look for yourselves here. Thompson & Morgan's New Product Development Manager, Michael Perry, will be visiting the garden on the 14th August with a photographer to look at the plants we have been trialling in the garden this summer and to see the garden overall! Who knows? We may end up in next years Thompson & Morgan catalogue! Professional Garden Photograper, Suzie Gibbons spent all day visiting the garden on 16th July and completed a photo shoot with a view to getting the garden featured in some national magazines this summer or next! Hundreds of images taken! Serena Thirkell has just placed this stunning sculpture "Sycamore" in the front garden, ahead of the Artwave exhibition due to start over the Bank Holiday weekend in August! The green bench by the pond had started to rot and one leg was badly broken at the last opening! So, a new white metal bench has just been purchased from Mays Terracotta, and looks fabulous in it's place, matching the white metal table already there! We opened again midweek on the 2nd July for the NGS and despite the weather being very grey and cool, we still saw 172 visitors come to see the garden, some having driven many miles as well! We also raised an astonishing �2 for the NGS charities! Many, like this group of ladies, braved the chill to have tea and cakes served on vintage china in the garden! 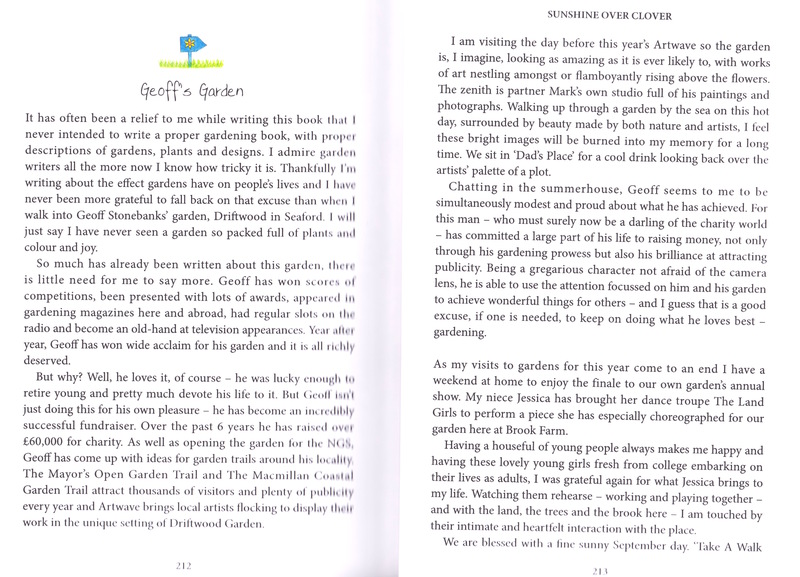 Great comment in the visitors book from Honore de Gronckel, "Magical & stunning planting! Great landscaping and ornamental features. Absolutely wonderful liked it very much! Thank you! We opened on the 30th June for St Wilfrids and the weather was glorious until we opened the garden gate and the mist came in from the sea and it felt really cold in the garden all day! We still had quite a few visitors and between the 2 gardens raised over �0 for the hospice with an incredible sale of plants at Sunningdale Close.Here you can see some of the visitors who braved the chilly day! Well done Debbie at 4 Sunningdale Close, for the monies raised on her very first opening. 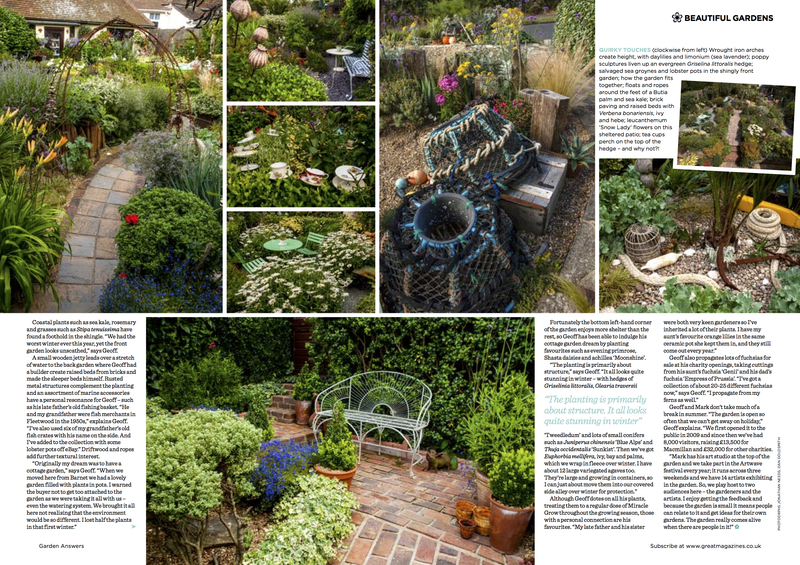 On 24th June I was approached with a proposition by the Daily Mail who wanted to use my garden as their launch garden for a new 360� PANORAMA in their on line Weekend Magazine! 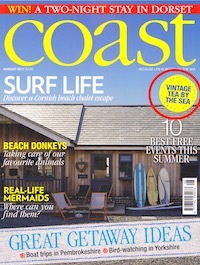 So, on 29th June, Driftwood was used as the first garden in the on line version of Weekend Magazine on page 53. They describe the new concept as "See Britain's finest gardens from all angles. Every week we'll feature an exquisite garden and invite you to take a tour. Simply tap the picture for a stunning 360� view. The creation of the 360� PANORAMA was a fascinating experience! The photographer actually filmed 5 sets of images were taken in the garden, 3 including me. They were then integrated, seamlessly, by the photographer as a complete 360� view of the garden. They were all quite amazing, with one finally being chosen to appear in the on line magazine! �000 worth of equipment used to create them in the garden. Here you can see the photographer, Drew Gardener setting up the equipment! A double whammy was had at the end of June, the garden was the featured garden in Sussex Life's July edition, in the lifestyle section (see full article below) and on the 23rd June, Driftwood had a full page feature in the national newspaper, The Mail on Sunday, Martyn Cox, the gardening journalist had visited the garden with a photograper on Friday 7th June and over 400 images were taken of both me and the garden. Read all about Martyn and his work here. On Sunday 23rd June, BBC Presenter, Natalie Graham came to open the Mayor's Garden Trail in the garden at Driftwood! Seen here with Cllr White and myself as she cuts the ribbon! Cllr White said after the event: "What a fantastic day Geoff! Thanks so much for all that you and everyone else have done to make this terrific community project a huge success! I was overwhelmed by the beauty of the gardens, even though the weather recently has done its best to mess all the hard work up. 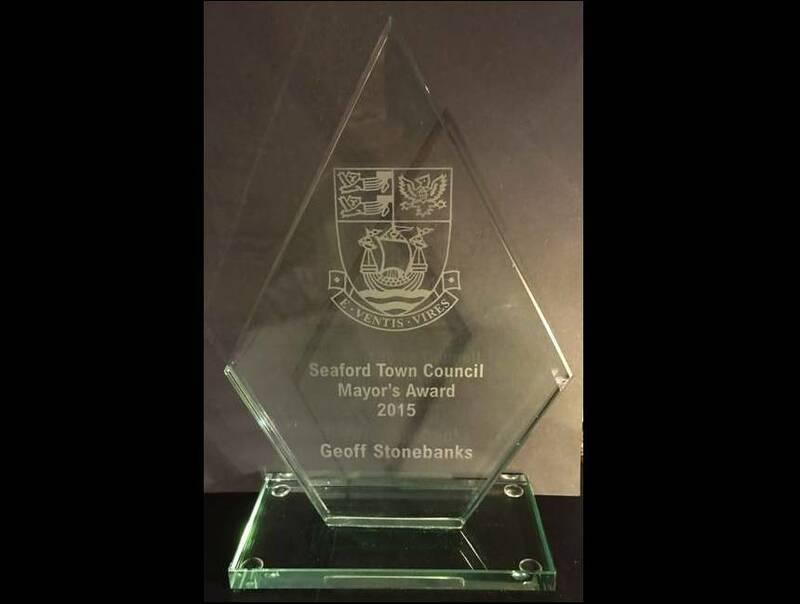 You are definitely one of the true community heroes of Seaford and one that we are very proud of. Great work, great fun! Thank you once again for all that you have done." Over the weekend of the 15th & 16th June we opened for the National Gardens Festival Weekend, one of the 800 gardens opening in England and Wales. On Saturday the weather was grim with 35 mph winds but we still had 183 visitors and on Sunday it improved with some rain then late sunshine and we saw another 112 visitors! Here you see Ray & Christine Forrest taking tea by the pond. They had travelled all the way from Addlestone, just to see the garden, as they had heard and read so much about it. There were many lovely comments about the garden, one of which was "An inspirational garden on a scale we can recognise." written by Roger & Dianne Mead. Many of the visitors had travelled some distance to see it! Driftwood's share to the total takings were �98 including all gate takings. Thanks so much to all visitors and helpers! On 12th June The National Gardens Scheme asked me to run a session for Macmillan staff, as I was also a fundraiser for them in Sussex and obviously had links with both organisations. I visited Macmillan's Head Office in Vauxhall to run the session about the relationship between them and the National Gardens Scheme and to run a hands on session as well. It was all to profile the National Gardens Festival Weekend and make their staff more aware of the importance of the realtionship with the NGS. Here you see me in full swing on the practical session about propagating fuchsias. On 13th June I held a web chat for Macmillan and the NGS. Check the link for full details of what happened. 26 Americans from Rhode Island New York visited the garden on the 11th June in the light drizzle, on a whirlwind tour of many Sussex gardens in their week in the UK. They were overwhelmed by the garden despite the poor weather! On the 3rd June Garden News put one of my images as their Twitter Header and commented on the garden openings in the issue of 4th June! See it here. Su Cloud brought her stunning seed pods in to the garden to display throughout the summer. Here you can see one pair in situ looking really great! We opened by appointment over the Bank Holiday Weekend and had a few visitors raising funds for Macmillan Cancer Support. 23 members of the Surrey Hardy Plant Society came to visit the garden on Saturday 25th May and had a fabulous 2 hours wandering around as the weather was very kind with lots of sun but a chill wind! Just submitted entries for 2 garden competitions for 2013, wonder if we might have the same level of success this year as last? I have prepared all the plants for sale ready for the first opening and my friend Celia has done the same with some from her garden, so we are all ready for the first openings as you can see from the 2 images. Guess what? Gnomes are made a rare appearance at Chelsea for it's 100th year with some celebrity versions! You can always find some cute ones in Driftwood garden every year! The garden is starting to come alive now, Tamarisk tetrandra on the right in the front garden. Victor Stuart Graham will be exhibiting, and selling, his unique windows (left) throughout the garden openings this summer. See his web site for more details here. Chris Burchell Collins will be selling his metal work, web site here. Fabulous example of his work on the right. Tea Time assortment china garden decorations will also be available again this year, see what will be on show here. Garden News tweeted and put the following on their facebook pages on Wednesday 8th May "This week Carol Klein explains why every garden needs a pond. But, don't just take her word for it - look at Geoff Stonebanks's (Driftwood Garden East Sussex) .... We're green with envy!" Then put a link to a picture of the pond shown below. Good publicity! The weather over the bank holiday weekend at the beginning of May was really lovely and a lot of work was done tidying up ready for the Surrey Hardy Plant Society visit on Saturday 25th May, closely followed by the group from Rhode Island in New York on the 11th June! On the left a new item in the garden. an old dining chair turned in to a planted feature. On the right a view down the garden from the summer house patio! This picture taken on 26th April shows the pond area of the garden looking really good! Let's hope the rest starts to look as good again soon! Our first opening is now only weeks away and there is still much to do in the garden to get it ready for it's first visitors! On 25th April it was confirmed that one of gardenings hottest new talents, Jack Dunckley, will come and open the Macmillan Trail, hot from his first ever Chelsea Flower Show where he has designed a garden entitled Juxtaposition, which will highlight the work Perennial does to help people who work in horticulture and their families in times of need. Back on the 3rd February I met up with the patron of the garden trail I am organising for Macmillan Cancer Support in August, Christine Walkden to thank her so much to her for agreeing to support the event. Full details here. Here I am with Christine after the recording of the Radio 4 Gardeners' Question Time programme in Brighton. I was also lucky enough to be one of the audience members chosen to ask a question of the illustrious panel! The March issue of Sussex Society Magazine has a lovely feature about the trail with some great pictures of garden 15, check it out here. Now the weather has started to improve I have been and bought all my annual bedding plants from a local nursery and have them in the garden ready to plant out! Over �0 worth are waiting to be planted! Hope to get them all in by the end of the week. A lot have gone in but these are those still waiting on the 23rd April! Not long before it starts to look like an award winning garden again! I hope!!!!! I was contacted by the producer of the ITV show "Love Your Garden" with Alan Titchmarsh on the 3rd April, with a view to using Driftwood as a good example in a make over programme for another garden about the use of different levels! She visited on 15th April to do some final checks but heavy planting reduces the views of the levels if filmed so she cannot use it for the show about levels. However, there is a good possibility of it being used on a future show! Over the Easter weekend thieves stole the 4 large buoys in the front garden, in full view of any passers by, even though they were staked and tied down! Some very sad people about! Fortunately Haven news put me in touch with the Port Authority in Newhaven and Paul Stevens has very kindly agreed to replace those that were stolen! On 29th March, Val Bradley, gardening correspondent for the Sun newspaper, wrote and asked for details on the garden and some images saying she was considering writing a piece on the newspapers gardening web site over the coming weeks, fingers crossed she does! Thompson and Morgan invited me to write a piece about my gardening experiences on the south coast and my involvement with their customer trials panel for their website in March 2013 which can be seen here. It's almost the end of March and the weather shows no signs of warming up. These 2 shots show the pond area in March 2012 (left) and March 2013 (right), what a difference! Where is the milder weather? This is so bizarre, the snow scenes below on Monday 11th and the Spirea Magic Carpet (right), bursting forth in the sun on Thursday 14th March! What is the weather doing? On the left the rambling rose Vielchenblau. Oh no! Snow fell on the garden again in March after the covers came off! The image on the left was in the Eastbourne Herald's "White Out" coverage on the 15th March. Let's hope everything will be OK! Even poor Hector, the tortoise, woke up when the sun was out and now too cold for him again! Off with the winter covers, the butia palm in the centre of the garden looks resplendent again in the early March sunshine! Busy cleaning down the paths and patios with the high pressure cleaner. On 19th February, I was approached, after the company had googled coastal gardens, by Outline Productions, an independent television company based in London, which is producing a new six part series for peak-time BBC1 in August about UK wildlife, which will illustrate how conservation efforts can save rare species. They wanted a coastal garden to take part and were considering Driftwood. Clare & Rebecca, from Outline, visited on the 7th March and filmed me talking about the garden but subsequently found one that had more wildlife in than Driftwood, still, all details on file for future referencee so time not wasted! Rebecca Leopold said "It was such a privilege to come and see your garden- both myself and Clare were really impressed with what you have done. We will most definitely bear you in mind for any future programmes to do with gardens as yours is an exemplary example of what can be done and your garden is truly worthy of being shown on television. Butterfly taken at Driftwood by Mark Glassman. A handout has been prepared showing the different wildlife that can be found in the garden this summer. The sheet will also identify the plants and shrubs in the garden that are helping to attract the wildlife to the garden so visitors can go away and plant them in their own gardens. I recently became a member of the RSPB (Royal Society for the protection of birds) in order to do more in the garden for them. While the lovely February sunshine prevails, I have been busy	tidying the garden. Here the cottage garden corner has been sorted with the hedges trimmed and the plants rearranged! While on the right spring must be here as the first crocus has blossomed! I have just created a small courtyard garden in front of the studio, at the top of the garden! It looks very elegant with the brick patio and box topiary around the edges. Now the lovely wire bench has arrived to finish of the illusion! Lovely place to sit and take tea this summer! Late last year we found a pair of rusted green garden gates in Hastings. I have now found a home for them in the garden. 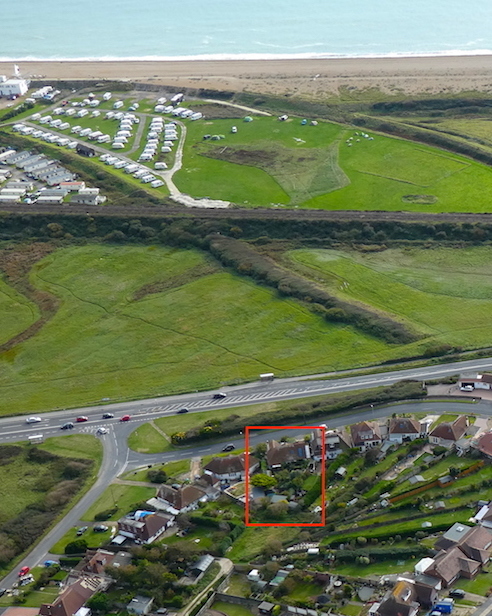 Here you can see one of them in position on the left of the garden, close to the green folly door! Now put in place the new piece of driftwood and the mesh trap found on the beach! They look great at the front! Snow fell on the garden in January and again in March and makes the rusted metal pieces quite stunning. Snow clad grasses look quite amazing too. Check out the other pictures on the garden images page as well. Interesting news in January, Thompson & Morgan have invited me to join their, invitation only, customer trials programme. So I shall be receiving new and exclusive varieties of plants not yet seen by the public to grow to the best of my ability in the garden/containers. I will have to provide written feedback and pictures which will be used on their website and catalogues and other sales literature. An interesting summer ahead! Visitors will be able to see the plants on show in the garden. See all the details on my blog by clicking their name. I wrote to the RHS, The Garden magazine, following a piece in the letters section about the power of front gardens in the November issue. My response and a small photo of the front garden appears on page 15 of the January issue of the magazine. We have changed the look of the front garden and put a new patio in front of the studio at the back. So, check our open dates and put one in your diary to come along and see the new look for next year! On the left the new patio and paved area in front of the studio at the back made out of bricks. Once new planting is done in the spring it will look fabulous! On the right, the complete jetty with the water flowing beneath it! More planting around it to be done in the spring. We have already got a private booking for 20 visitors at the start of the season next year and have recently had a enquiry about booking 30 visitors from Rhode Island in the States to come and see the garden in June! Amazing! If you have a group you would like to visit please get in touch! Just received in the post the lovely engraved crystal vase, shown here, which is my fabulous trophy for winning the Garden News best small garden award for 2012! Thanks to all the team at Garden News! Let's see what we can achieve in 2013! Before Christmas I began tidying the garden ready for the winter. Lots of trips to the dump to get rid of the debris! Some of the plants in the garden have got their winter coats on, see right! Several new plants have already been purchased and will be nurtured so they look good next year. Quite a lot of new planting at the front especially grasses! An amazing double award winning year! Thank you so much to all the 2021 visitors who came to the garden in 2012 and helped us raise an astonishing �00 for the various charities we were supporting throughout the year! Thank you to Yorkshire Tea who so kindly donated all the tea served in the garden during 2012. We sold an incredible 940 cup cakes and sold 934 cups of tea! Thanks for your support and to our many helpers, Celia Hughes, Richard Walsh, Clare Mayers, Rosa Bottrill, Janice & Mario Dennington and my mother Barbara Stonebanks! It was also a good year for recognition with 2 national awards for the garden in 2012. 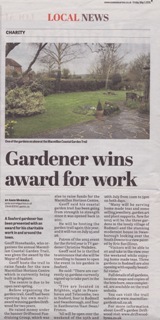 Gardener of the Year, Best Small Garden 2012.
pages 6 and 7 shown below. Click on the feature to see more detail from the newspaper. On Tuesday 18th September Garden News published their results for the Gardener of the Year Competition and Driftwood was the winner of the Best Small Garden Award. 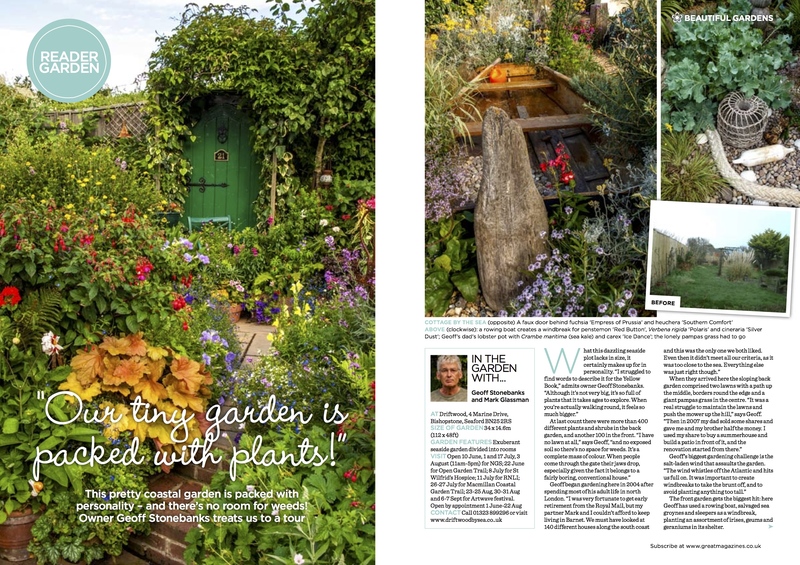 A full feature on the garden appeared in the magazine on 9th October. Click here for full details and see the detail on their facebook page. Geoff Hodge, one of the judges said of the garden, "Small gardens can be a challenge trying to fit in everything you want. They're even more of a challenge when they're on a slope, making them look even smaller. But Geoff Stonebanks has created something special, filling his garden with huge range of plants without making the garden look cramped. Individual sculptures and the results of Geoff's beach combing (he lives close to the sea) equal a coastal heaven with its own distinctive personality." 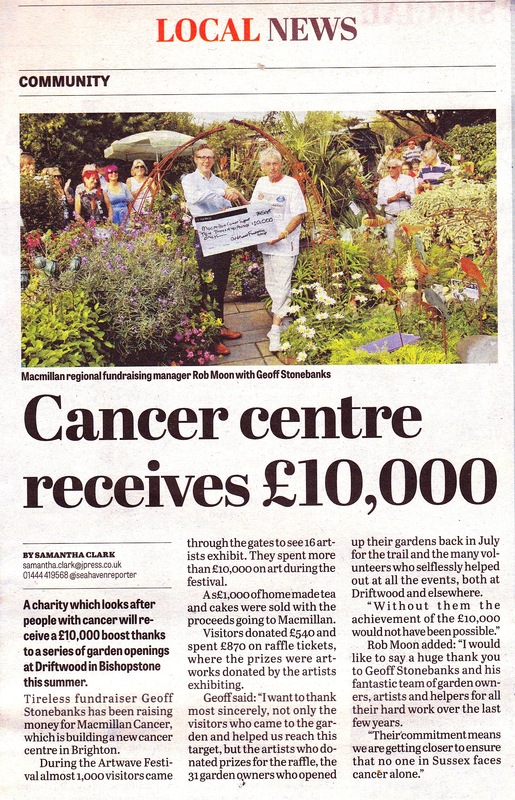 On Monday 17th September there was another great piece about the garden, with picture, in the Brighton Argus. 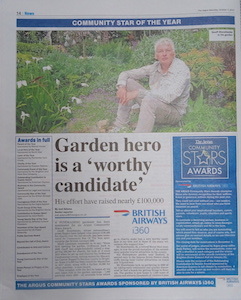 Additionally all the newsagents boards outside the shops were saying Bishopstone Gardener's Awards Hat-Trick! There was a great article in Sussex Express on Friday 14th September, see right. Janice Dennington, one of our intrepid helpers said, "Well done -smashing write up in the Express. We are proud to know you and being involved was great fun. Good luck for 2013 hope to be there!" out of over 1200 entries nationwide! The only one in the South East! I was totally overwhelmed to receive a phone call on Thursday 28th June to learn that Driftwood had been shortlisted from over 1200 entries in the final 12 for the Daily Mail National Garden Competition 2012. Click here to learn more. Two judges visited on 6th July and subsequently confirmed I was in the final 4 in the whole country. One garden was in Montrose in Scotland, one in Manchester, one in Reading and Driftwood. Three more judges visited again on the 24th July. A journalist interviewed me and a 2 photographers took several hundred photographs of the garden some of which were used in the feature that appeared in the Daily Mail Weekend Magazine on 4th August. Hamish Webb, one of the judges said in his letter below, " Nick, Tim and myself found choosing a winner from four such fantastic gardens very difficult. Any of the four were good enough to win, different judges may, I suppose, have chosen a different winner". Our prize for being a finalist is a cast iron plaque for the garden marking the great achievement of reaching the final 4. The judges, chaired by garden designer Tim Sharples, evaluated what each garden had, in the light of its position, space and intentions. Tim, however, was fascinated by the provenance of some of the plants and objects in the garden that have lots of personal memories and associations. He was very complimentary as he said it was much harder to work with a small garden and achieve this level of success. In his own words, he certainly got the "wow" factor as he entered the back garden! On the right the letter confirming my finalist plaque. Click here to learn more of our involvement in the competition. Apart from the NGS and Mayors Open Garden, we opened for the Macmillan Coastal Garden Trail on the 5th August which Dame Felicity Lott, the world renowned operal singer, officially opened, was amazing, across the 9 garden trail we raised an astonishing �00, Unbelieveable!. We raised a staggering �16 over the 4 openings for the National Gardens Scheme this summer. When we opened for the Mayors Open Garden Trail on the 8th July, the weather was against us, however the visitors were not. We had over 100 people came and raised an amazing �13 for the Mayors 2 charities. The garden looked great for the 3 NGS and St Wilfrid's openings, and visitors were able to enjoy their tea and cakes on the new beach garden overlooking the sea and watch the Newhaven Ferry go out! The garden looked really great for the visitors during the openings, by appointment only, over the Jubilee weekend, despite the pretty poor weather over the 4 days. The winds overnight 7/8th June decimated parts of the garden, snapped off standard fuchsias and damaged plants in exposed borders. There was a fabulous 2 page feature about the summer events in the garden in the May issue of Sussex Society Magazine, & on the Royal Mail web site on 5th May. With the weather being spectacular towards the end of May, the garden really took on a new look for summer. At the start of May it was pretty poor. 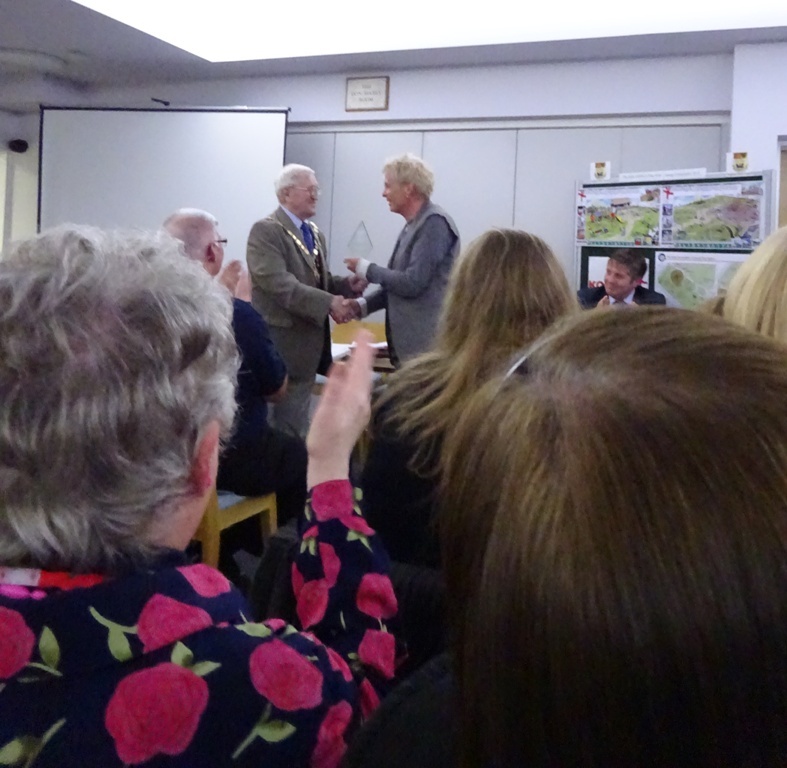 Many thanks to the Mayor of Seaford, Cllr. Linda Wallraven, for putting me forward for a Community Service Award in 2012, in recognition of the monies raised by opening the garden over the last 3 years and in particular organising the Mayor's Open Garden Trail for Seaford which will take place on Sunday 8th July this year. See article on media page. The tree in the garden was given a professional trim in April, and looked much better. The gorgeous weather in March, meant that it started to take on a real spring look with daffodils and tulips, all the furniture and garden decorations were put out ready for the summer. 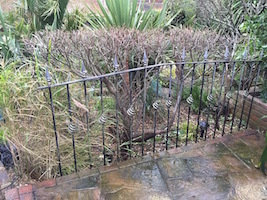 Despite the extremely cold weather in late January and early February, along with the really dreadful weather and high winds in the middle of December and early January, the garden did not really sustain any damage! The 2012 NGS Yellow Book was published at the end of March and Driftwood featured on page 552 and 565 with a photo of the garden on page 562. There were 4 openings for them in 2012. We made the most of the great weather in October and also made quite a few changes in the back garden. Lots of plants and objects were relocated, along with the building of 5 small, new raised beds (picture of one in the process of being built on the left) in the centre, up the steps and a purpose built display area for selling plants next year, behind the greenhouse. Check out the development page for more pictures and details of the new work. The front garden underwent a transformation in late September/early October. 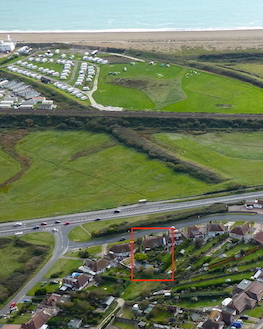 On the left is how it looked before the new coastal garden was built. We've now got a small boat, lobster pots, groynes and some fish crates on the gravel beds all bordered by old railway sleepers. See picture on right. Check out how much has been done on the development page. There is still more planting to do through the winter. Thank you so much to all the visitors who came to Driftwood in 2011, an amazing total of 1883 from June to September. We sold 600 cup cakes and over 700 beverages, along with raising �00 for charity this year alone. The Artwave event from 27th August through until 11th September was an unbelievable success with over 1000 visitors coming to the garden over the 3 weekends, up 77% on 2010. We sold over �00 worth of tea and cakes, and artist sales were up 48% on the previous year. Our average daily attendance was 152 visitors which was incredible. The weather, in general was OK, quite windy at times and we did get some heavy rain on some of the days but it did not seem to dampen the ardour of the visitors who came. We had lots of lovely comments from visitors, some of which appear on the visitor and charity pages. It is a great shame that Lewes District Council and Latest 7 decided not to run a "Best Open House" competition again in 2011. Many visitors were asking for the cards to fill in, alas, a hat trick was not to be! Our visitors were extremely generous, we managed to raise �16 for Macmillan Cancer Support through the donations given for appreciation of the garden, the raffle, made possible by the donation of lovely gifts from Katie Green, Mark Glassman and Jayne Ford, and the proceeds from the tea and coffee sales. Thank you so much to all those who supported the event. Recently found a clever application on my iPad which will create symmetrical images of the garden, here is one from the summer of 2011. There are 3 more on the garden images page as well! Pictured left is Rachel David, Fund Raising Manager for Sussex, from Macmillan who came to do the draw and receive the cheque from me. In the middle Anne Megan Griffiths one of the artists. On the right Liz Davis receiving her first prize in the raffle. There were 8 prizes in total and the winners are listed on the Artwave page. Bank Holiday Monday was extremely busy and unfortunately, found some of our visitors having to queue to get in the garden as we were so busy, see picture on left. We do apologise to everyone who visited in the hour or so where this occured. Clearly, the garden has it's capacity and it was well and truly exceeded in that hour. During Artwave in August/September, the artists' work around the garden looked fabulous. Some images of the work that was on display is on the Artwave page. There were tables and chairs on the front lawn, so visitors could sit and take tea and cakes with a fabulous view of the sea. Visitors were also able to have lunch here too, as we had ricotta cheesecake, sun blushed tomatoes with leaves or savoury cup cakes. A very special thanks to our friends Celia, Richard and Clare for all their invaluable help serving tea and cakes. As a bit of fun and in recognition of the gardens popularity in 2011, the very positive comments entered in the visitor's book, and those received from friends, family and the many articles written about the garden, my partner, Mark, awarded me this cup for "The Most Outstanding Garden Award". The weather was excellent for the additional opening on the 14th August for the Mayor's Open Garden event. The Mayor, Linda Wallraven and her consort, Liz Holland, are seen with me in the garden on the far right. Richard Plowman, Chairman of WAVES Family Support Service, the nominated charity, expressed his immense gratitude to us and all the helpers at Driftwood saying how delighted and grateful he was with our support for families in need, in Seaford. Norman Baker is seen here talking with the Mayor of Seaford and her consort. We had a staggering 200 visitors to the garden in the space of 3 hours and sold over 100 teas and cakes. The total raised for Waves was almost �0. Many, many thanks to all those who helped to make the day a great success, those who volunteered and those who came along on the day. The weather was favourable for the opening for St Andrews Church on the 23rd July when we raised �6 for the maintainance of the church. Once again the Mayor, Linda Wallraven, was on hand to cut the ribbon and officially open the garden. The Mayor and her consort, Liz Holland, are shown enjoying tea and cakes with us in the garden after completing their official duties. The weather improved for the first half of the Seaford Open Garden Day on the 17th July, then the rain came down and put a damper on everything halfway through the afternoon. We still managed a reasonable turn out of over 100 visitors, brollies and all! Once again we were very grateful to our friends, Celia & Richard, who helped us on the gate again! The weather was fabulous over the weekend of 2nd/3rd July for Sussex Beacon's Garden Gadabout and we raised a total of �5 for them, thanks to all those who came along and contributed to the charity! Thank you also to all those who wrote some lovely comments in our visitors book, some shown on the visitors comments page. Particular thanks to Charlotte Weychan, The Galloping Gardener, who gave us a fabulous review on her gardening blog website. See the link on the media and blog pages to read it. Baskervilles, a local gardening group, visited Driftwood on Monday 27th June for an afternoon of tea and cakes with a private view of the garden, which went down very well with them all. The weather for the National Gardens Scheme Day on the 25th June was not as good as we had hoped. It was overcast and a little windy most of the day. Our good friends, Celia & Richard, pictured left, kindly helped out all day with the visitors who came to see the garden. The 3 gardens in the Seaford & Bishopstone Group raised just under �00 for NGS Charities, so not a bad days work in the end. The weather was in our favour for the first of our openings in 2011 for the Cinnamon Trust opening on Saturday 18th June when the Mayor of Seaford, Linda Wallraven, seen here, officially opened the event by cutting the ribbon. More than 50 visitors came in to the garden during the afternoon and we raised �5 for the Trust from donations, tea, coffee and cake sales and a stall run by Angela Harris. Many thanks to those who supported the event. During 2010, from July to September, with 13 openings, we welcomed 1115 visitors to the garden, raised �69 for charity and sold 586 cakes and 483 drinks! In September 2010, for the second year running, our 600 visitors to the Lewes District Artwave Festival voted Driftwood their 揃est Open House� out of the 97 venues in the competition sponsored by Latest 7 Magazine. In July 2010 the garden was judged the 揃est Back Garden� in Seaford and won the Jubilee Cup for 揃est Overall Entry�. 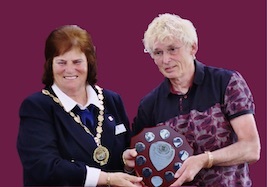 See picture left being awarded the prize by the Mayor of Seaford. 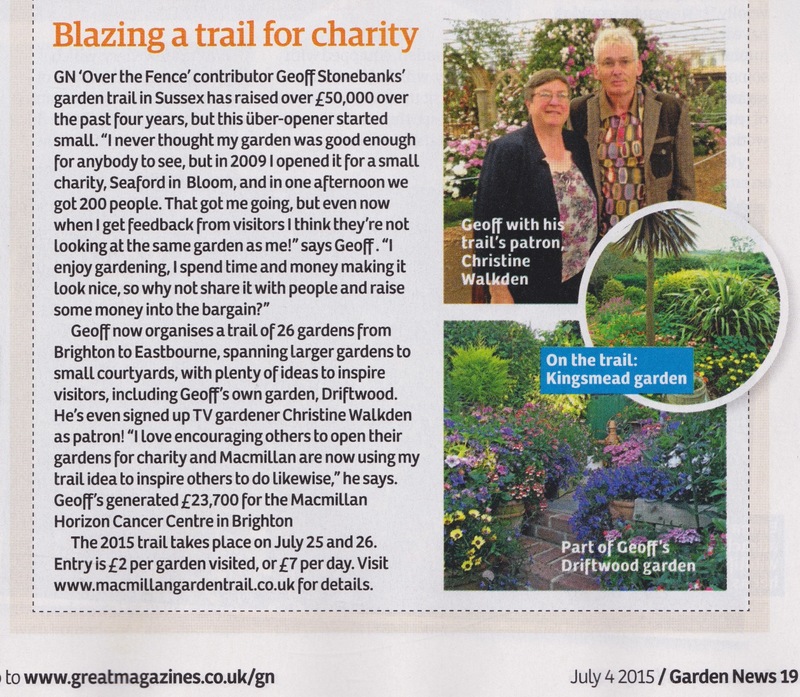 We also had over 200 visitors to the Sussex Beacon's Garden Gadabout that month as well, raising over �0 for them. Additionally, in August, we opened to raise funds for St Andrews Saxon Church in Bishopstone village and raised over �0. In September 2009, our 200 visitors to the Lewes District Artwave Festival voted Driftwood their 揃est Open House� out of the 80 plus venues, in the competition sponsored by Latest 7 Magazine. 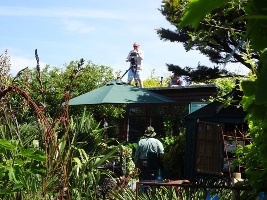 In July 2009 the garden opened for the first time after being persuaded, even bullied, by friends and family to enter the "Best Back Garden Award" in Seaford. On the open garden day we had over 200 visitors and those that came towards the end told me they had only come because friends in other gardens, who had already seen Driftwood, told them they must come to see it. At the awards ceremony in August, I was extremely pleased to receive the certificate from the Mayor of Seaford for coming third!